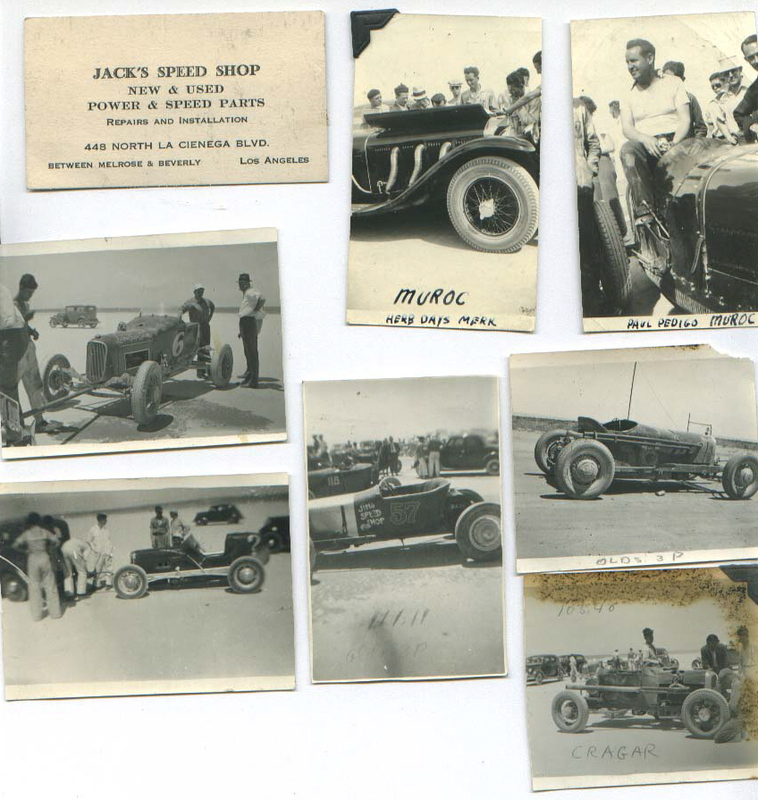 Vintage Road Runners pictures - a nostalgic visit to Dry Lakes Racing and Hot Rods! 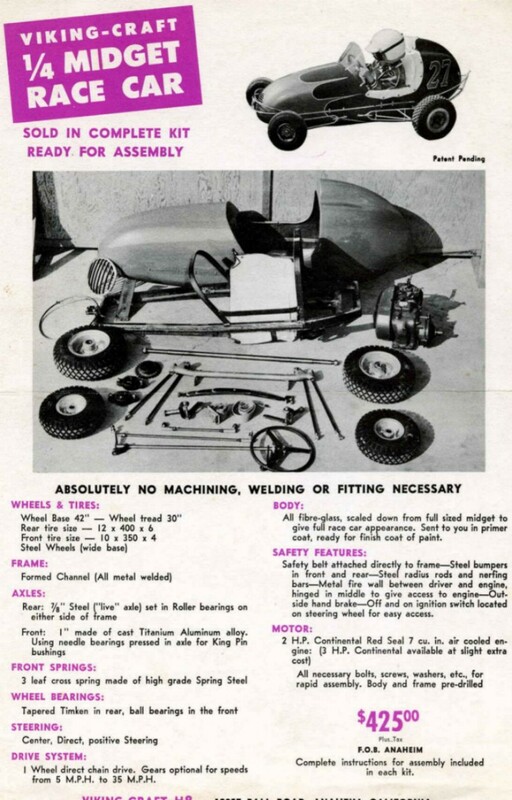 This page is and will always be "Under Construction". 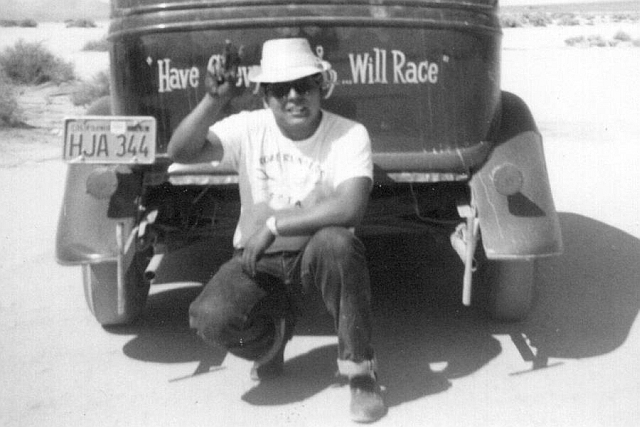 As time goes by we continue to receive pictures and information from Road Runners, past and current, and their families and friends. 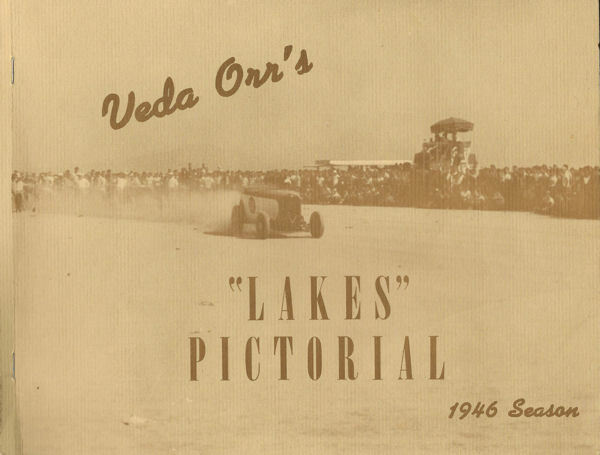 We greatly appreciate them sharing these valuable pieces of Dry Lakes and Hot Rod history. As new pictures and information is received, it will be added to our Road Runners website and to our historical archives. 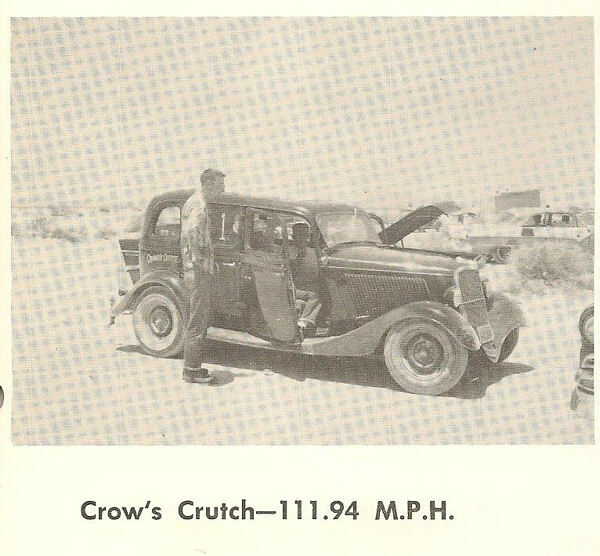 © Copyright Notice: All material on this page, associated pages and on the Road Runners website is copyrighted. 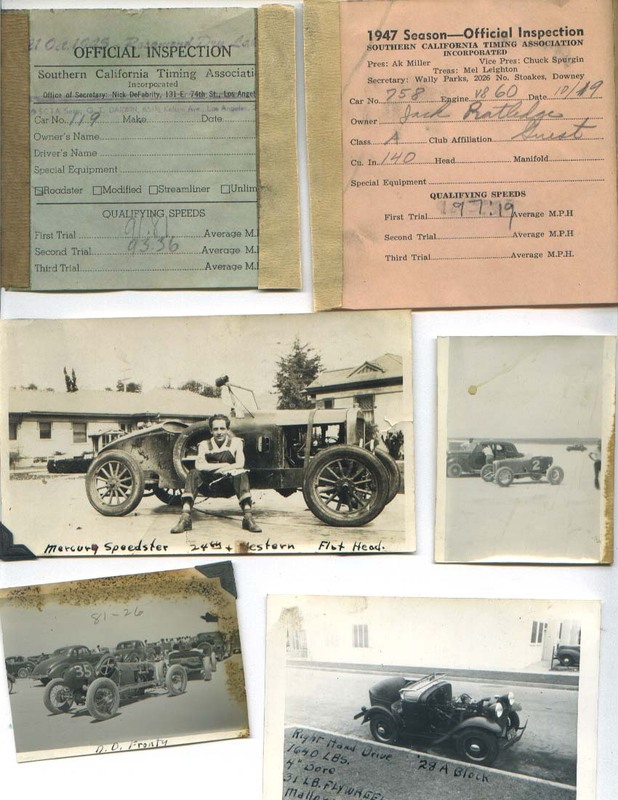 If you would like to use any of the pictures or information herein, please contact us and request permission. 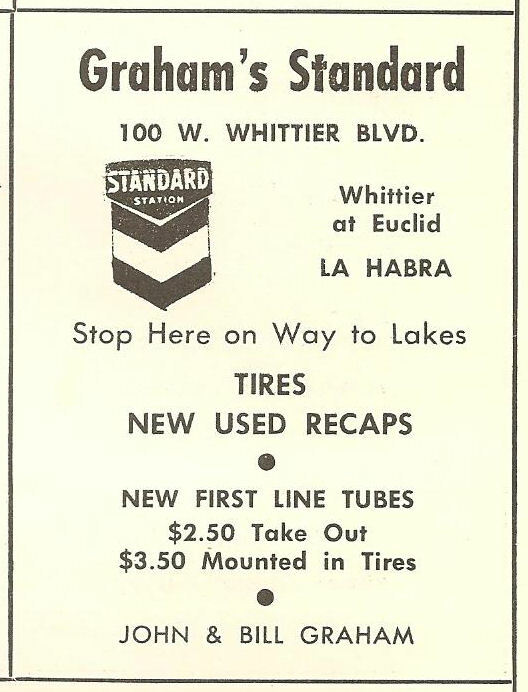 When used, please give source credit for all material. 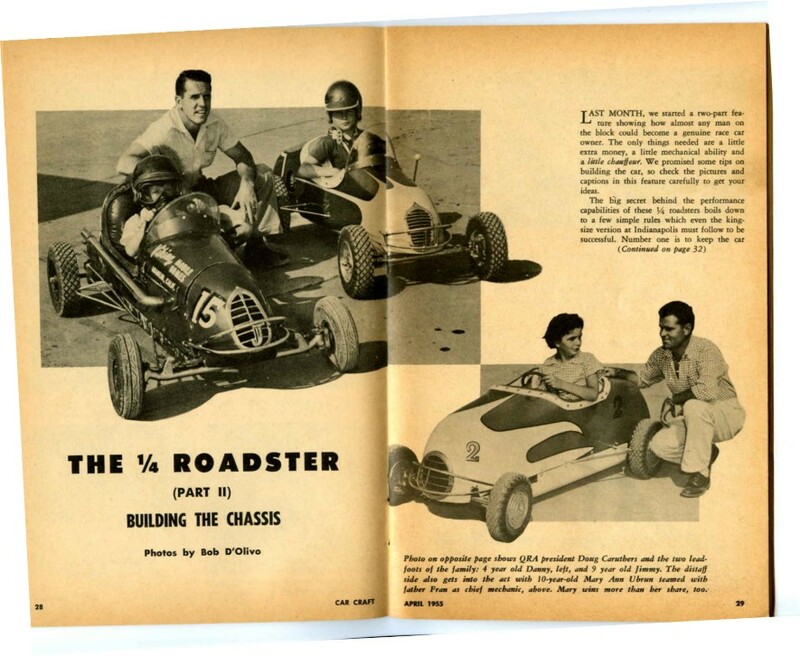 Webmaster note: The Jack Ratledge collection of pictures is what started our quest to find old Road Runners pictures and directly led to the development of this webpage. 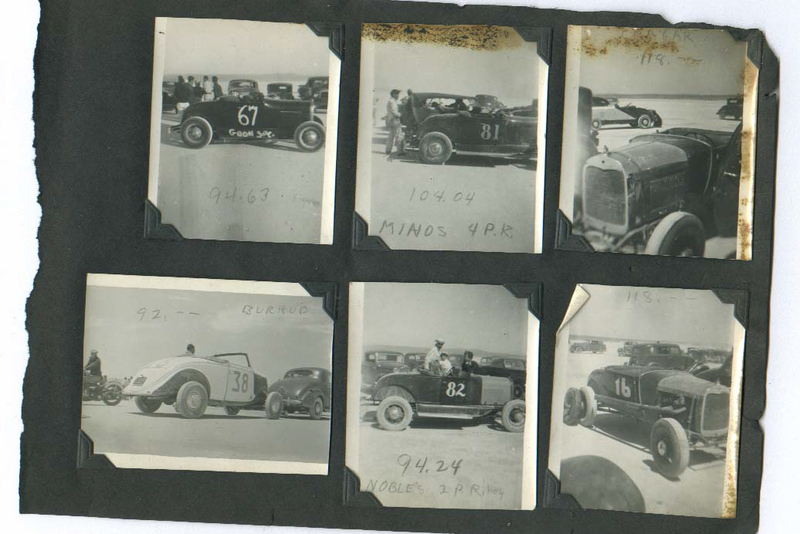 We continue to discover more information and learn more about the individuals and cars in these pictures even as we receive new pictures. 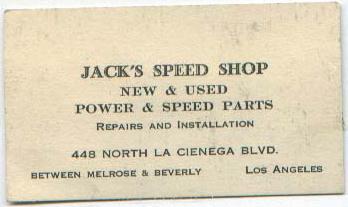 We hope you enjoy your visit to "yesterday" and invite you back often. 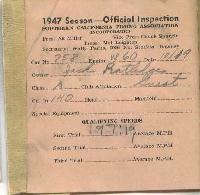 Webmaster Note: I spoke at some length with Jim Miller (SCTA & AHRF Historian). 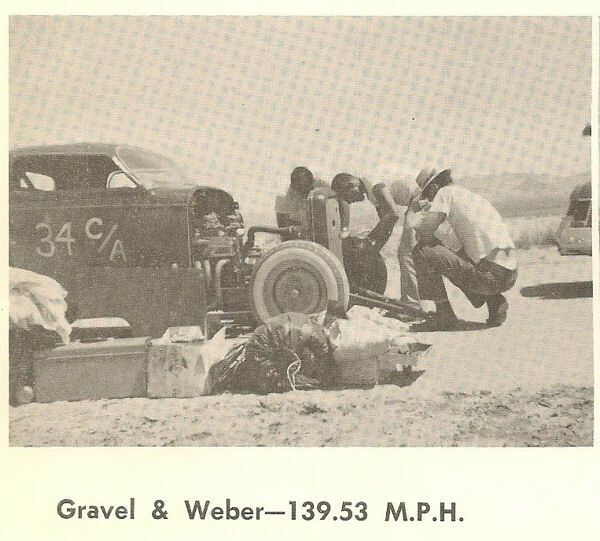 He reviewed the pictures and read your information along with what I found in the 1948 SCTA El Mirage program. Jim says he is pretty sure he knows your Dad's roadster and has some pictures of it in his archives. 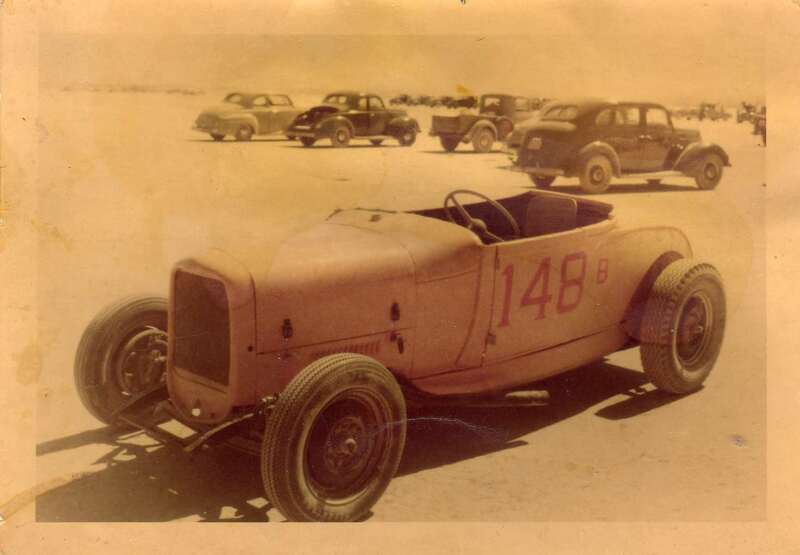 He said there was only one Bantam (Austin) Roadster that ran at El Mirage that he has ever found in his research. 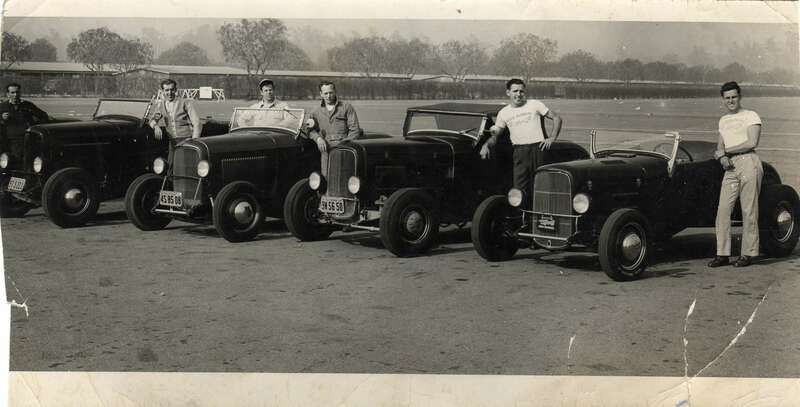 That had to be your Dad's. 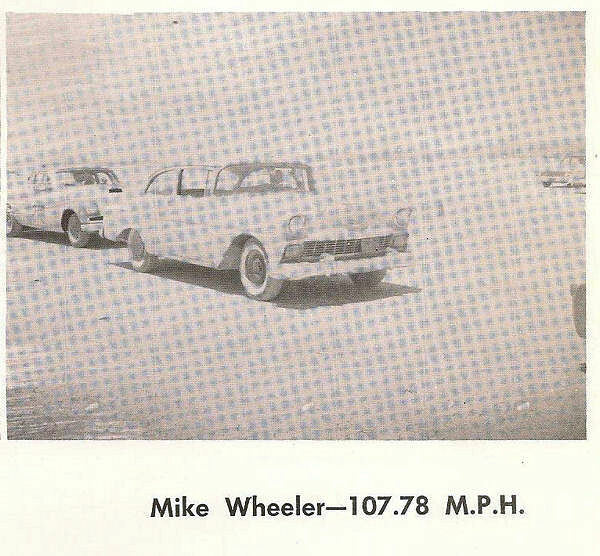 Speed: 97.19 - running as "Guest"
It appears the Inspection Slip for the October 21, 1945, Meet at Rosamond Dry Lake was either a non-sanctioned Meet that was using old SCTA Inspection Slips or, it was a SCTA sanctioned event that pre-dates the meet at El Mirage in 1946, therefore providing possible evidence to "re-write the history books". 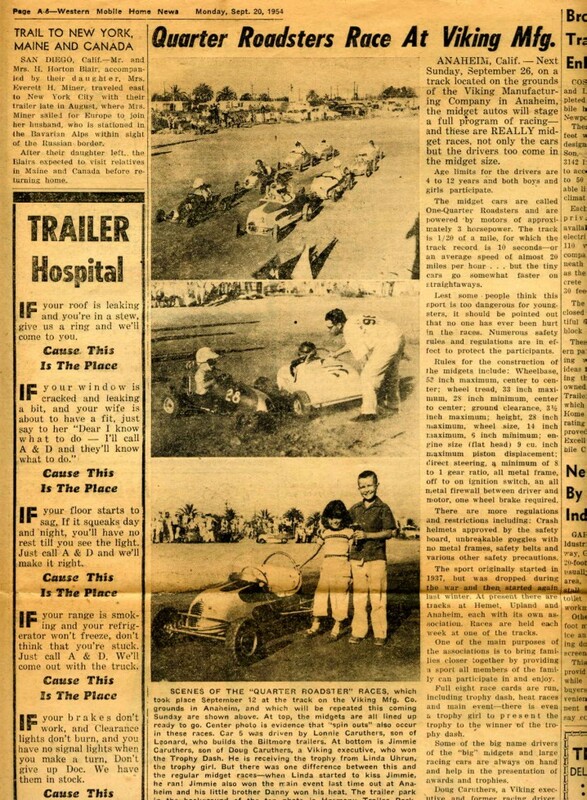 Or ????? 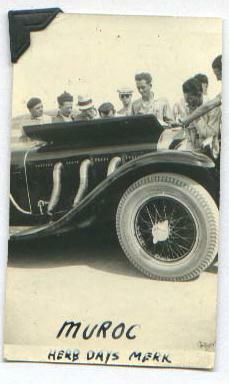 - who knows! 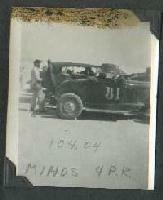 If someone does have information about the "mystery", please contact us. 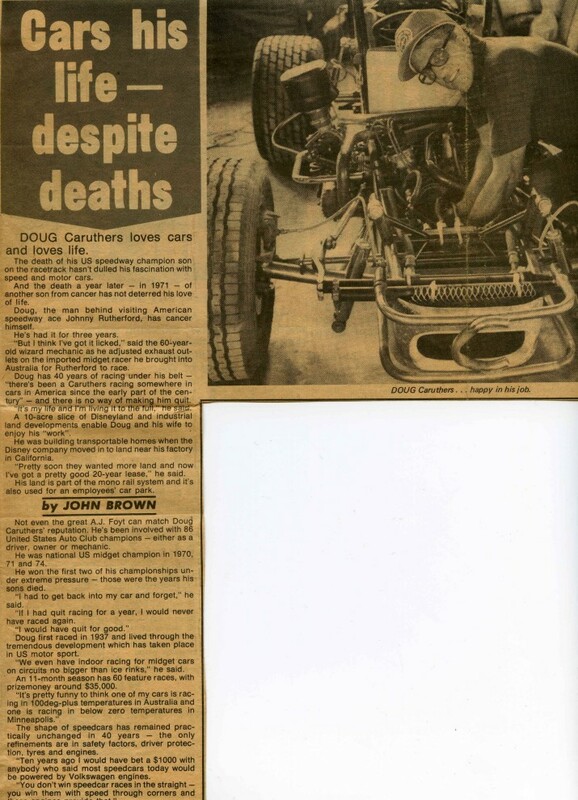 Very interesting!! 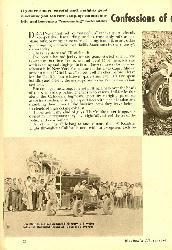 Here is a little info to clear up some misinformation and add more confusion to the year 1945. 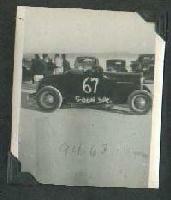 Boswell "Bozzie" Willis was the S.C.T.A. 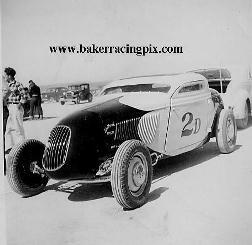 president, Nick DeFabrity was Secretary and Mel Leighton was Treasurer when they shut down official racing in June of '42 due to WWII. 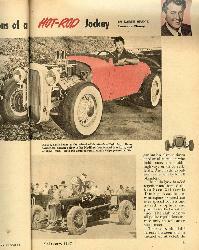 Willis, resumed his role as President along with Leighton and new Secretary Thatcher Darwin in '45. 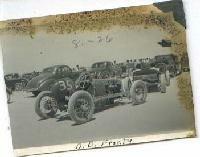 They decided to get things rolling again and scheduled a race to be held on October 7, 1945 on Rosamond Dry Lake. 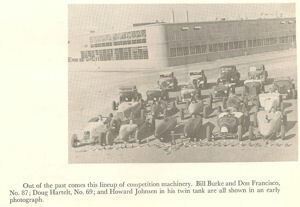 A program was printed with 70 entrants listed. 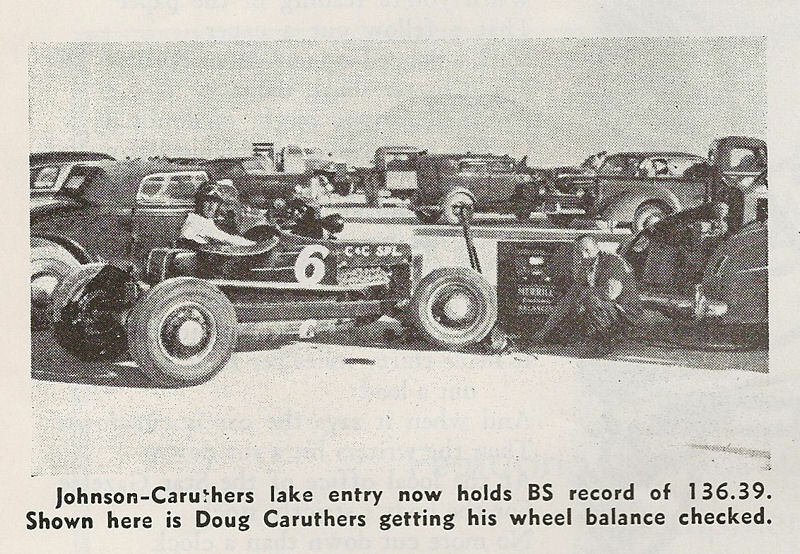 After being inspected and some cars running, mother nature came along and deposited rain on the formerly dry lake to make it a mud hole. Needless to say the event was called. 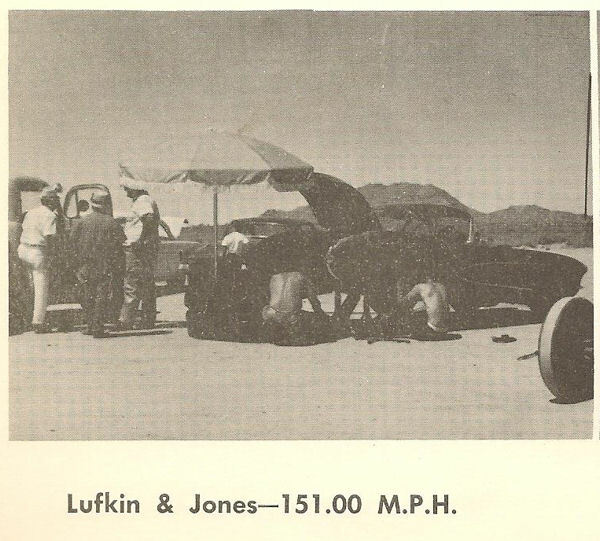 Some of the boys took off for dry El Mirage where the Pacific Coast Timing Association would time runs for a nominal fee. 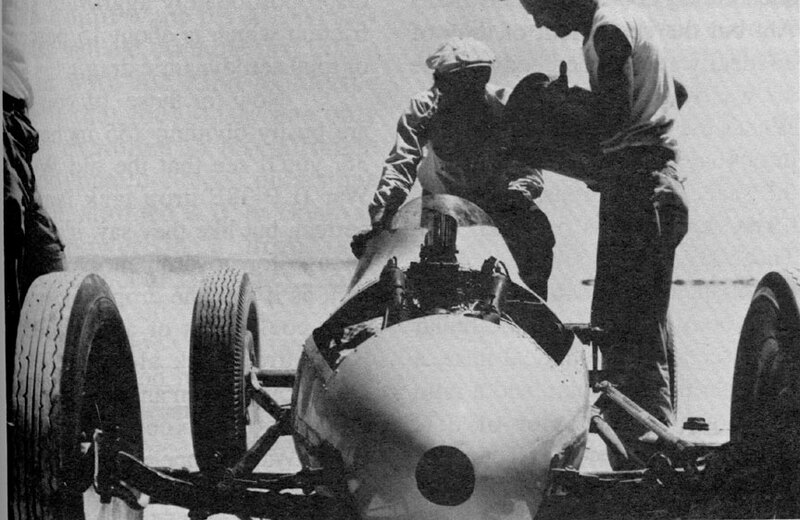 After that things hit the proverbial fan. 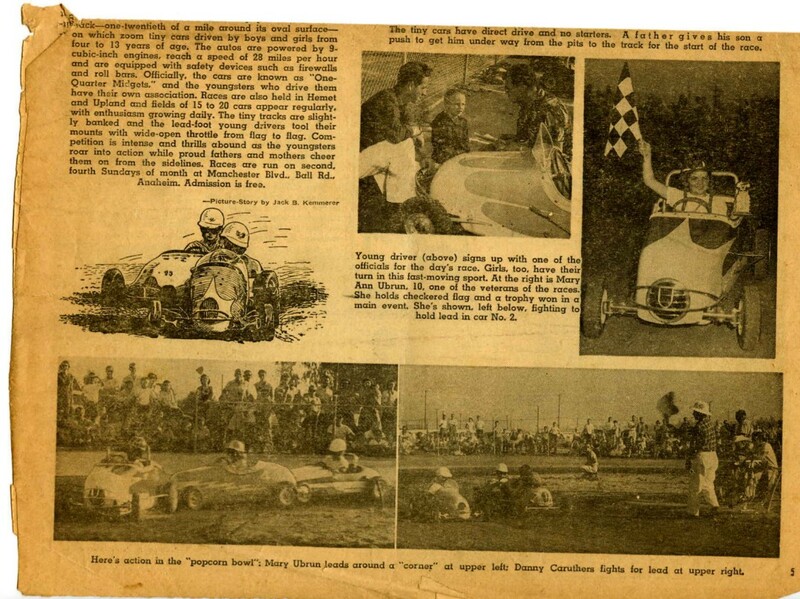 Some guys said it was unfair to hold races without everyone back, two scheduled races didn't equal a Championship. Others said the orginization wasn't legal since paperwork to re-incorporate wasn't done. 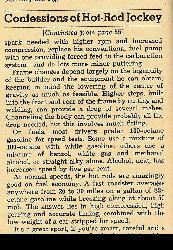 And what about elections for Officers? 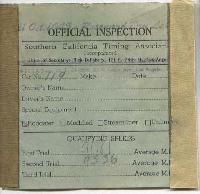 The October 21st timing slip is a mystery as no mention of it was published in the S.C.T.A. 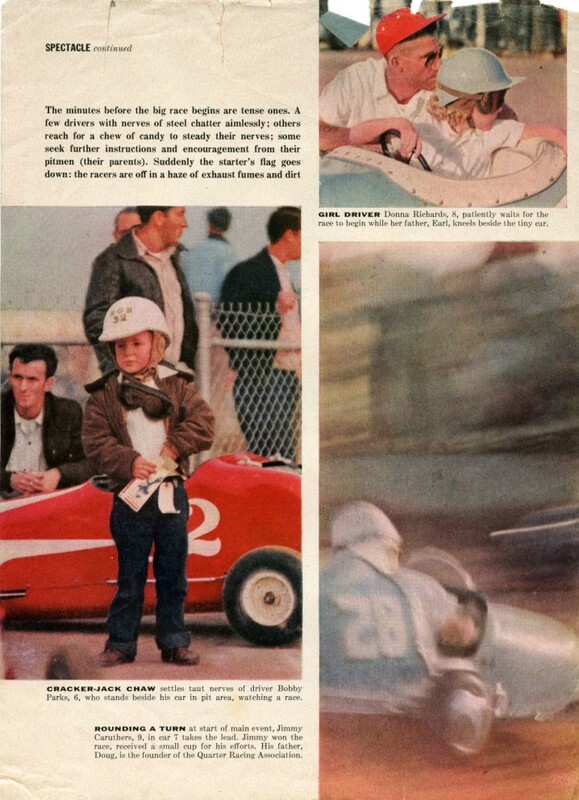 Racing News. 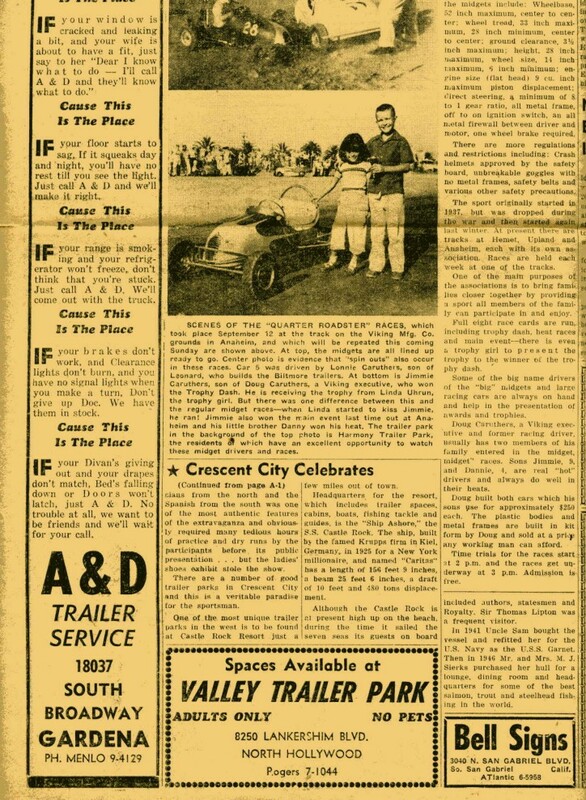 There was another meet scheduled for November 25 but that too was scrubbed because of Sacremento "Red Tape" reguarding Incorporation. 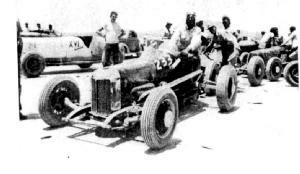 The boys had to wait till April 28, 1946 for racing to begin in earnest under the guideance of its new leaders, President Wally Parks, Vice President Bob Rufi, Secretary Randy Shinn and Treasurer Mel Leighton. 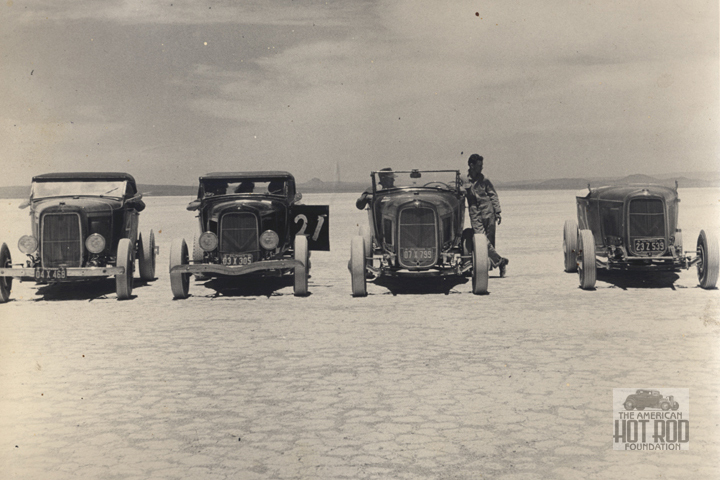 Jack Ratledge's Bantam Roadster (far right) had a '28 A, 4cyl engine. 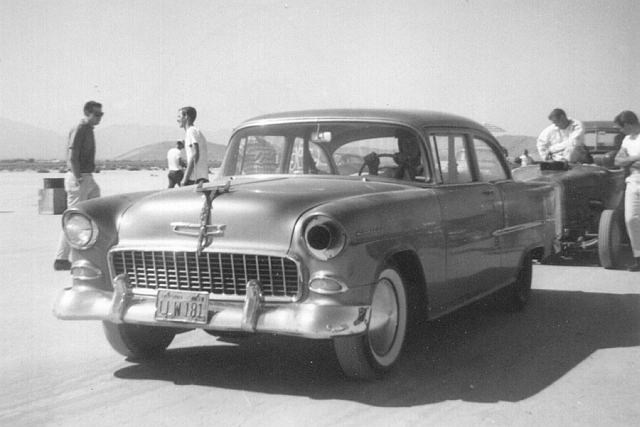 Jim (son) remembers, "All I know is that when I was growing up from '53 till the late 60's that it had a V-8 in it and it just sat in our back yard before he sold it to a Sgt. 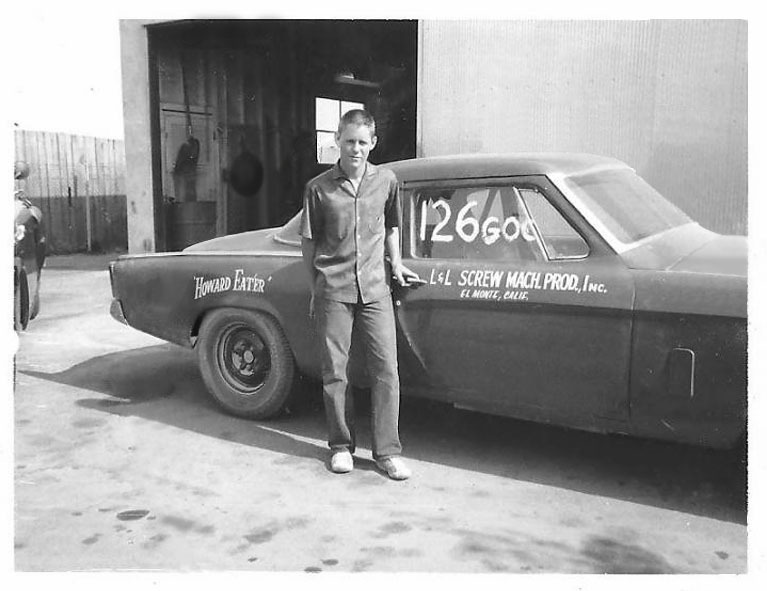 in the Air Force, named Ernie, while I was in the military. 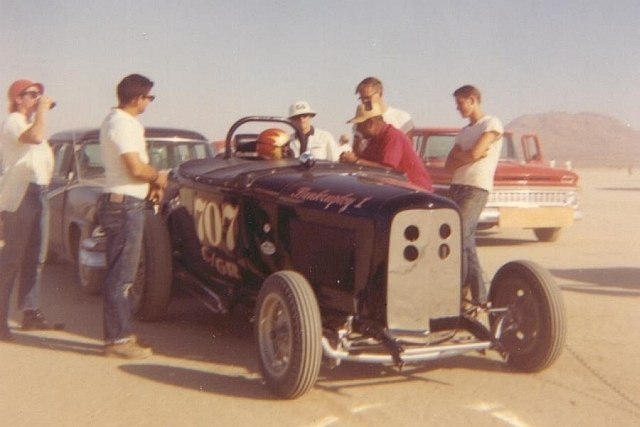 I tried for quite a while to try and find it, ran ads in the local papers and out in papers around Edwards Air Force Base to no avail.... Oh, a little bit of information on the Bantam - - - he named it "The Jimmy Special"." 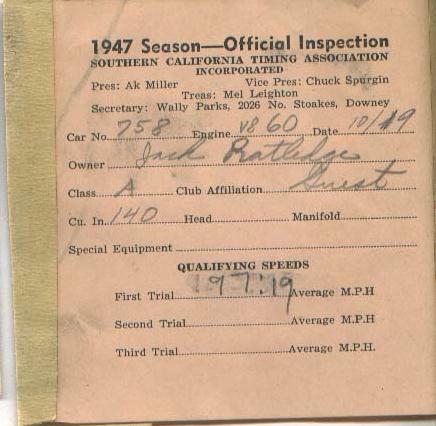 Webmaster Note: My guess is that the SCTA Inspection Slip from the October 19, 1947 Meet (above) is for Jack's Bantam Roadster, after the engine swap from the '28 A "4 banger" to the 140cu.in. 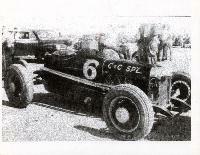 V8-60 flathead. 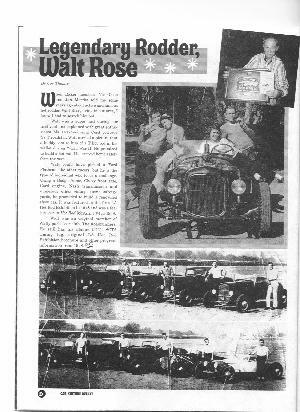 He ran as a "Guest" entry and likely joined the Road Runners following that meet since he did join the Road Runners in the 1947 season. Hi, my name is Don Baker, I was in the club in 1948 and '49. 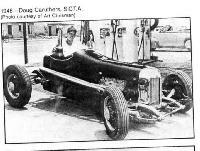 I ran a 29 A roadster and later a 27 T rear engine roadster. 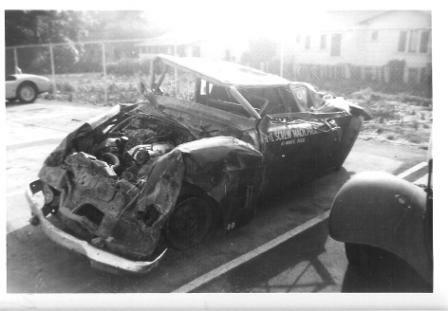 My partner in the T was Fred Reno also a member. 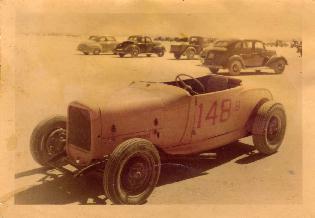 We took 1st in B roadster class a couple of times with the T at El Mirage. 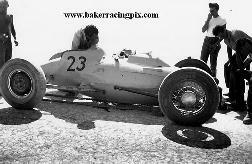 My 29 A number was 148 the T's number was 55. 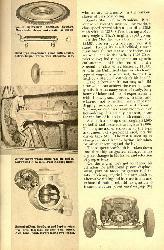 All picture of the T have been lost. 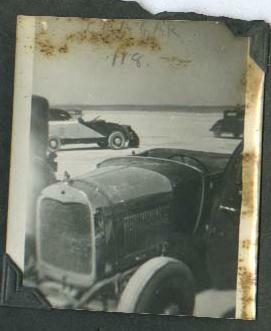 Hoping someone has pictures. 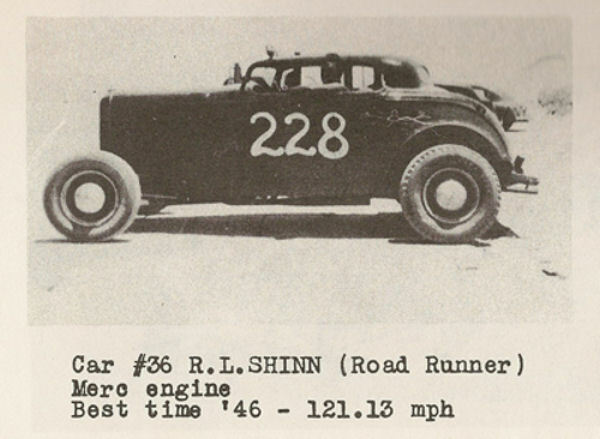 For the first meet of 1948, in April, Fred Reno ran a B liner # 147 that turned 110.29 mph. 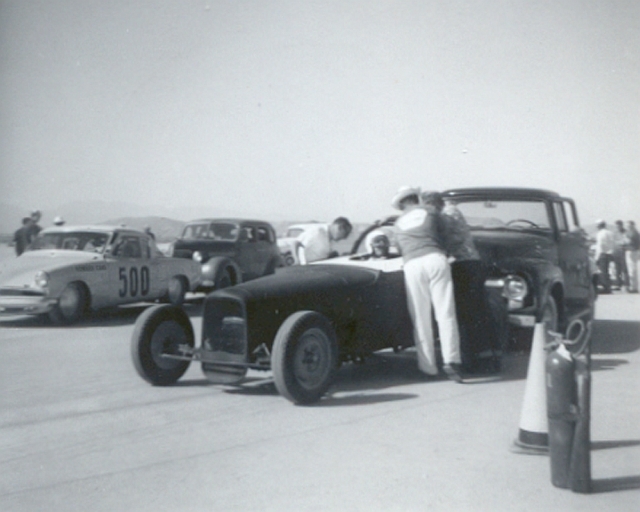 At the second meet in June Fred was back with his # 147 and Don was entered in B rdstr as # 148. 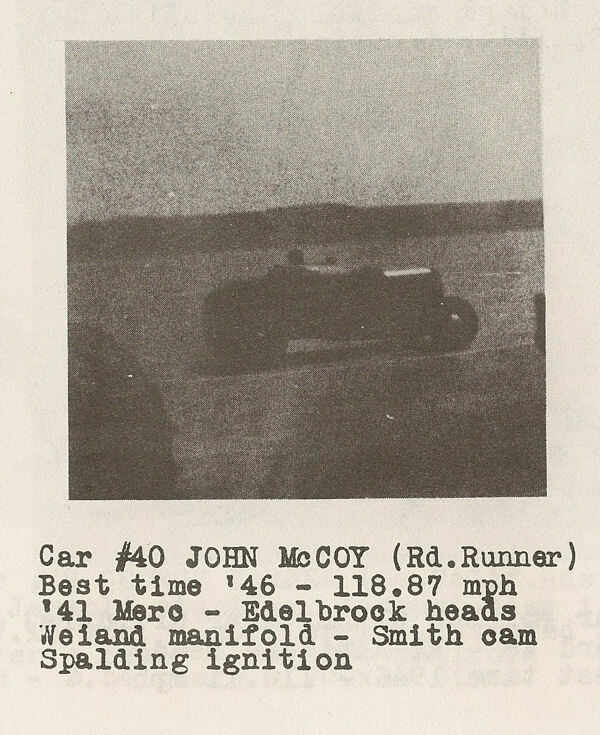 The program listed the motor as a 249" '46 Merc with Navarro heads and manifold, Smith cam and Kurten ignition. 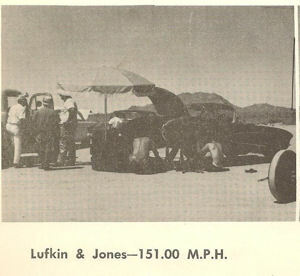 Fred ran 106.54 mph and Don ran 118.89 mph for 13th in class and got 90 points. 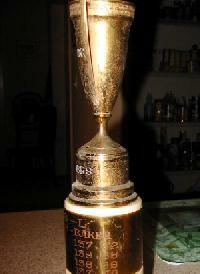 Both were entered again in July. 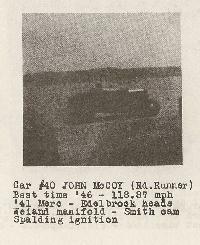 Don switched to a Finkle cam for this meet. 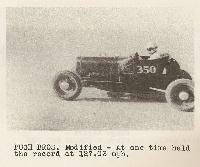 Fred ran 117.18 mph for seventh in class. Don ran 122.78 mph for around 21st or 22nd in class. 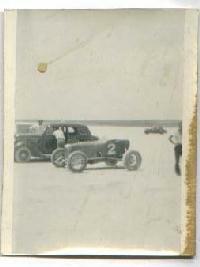 In August again both cars entered. 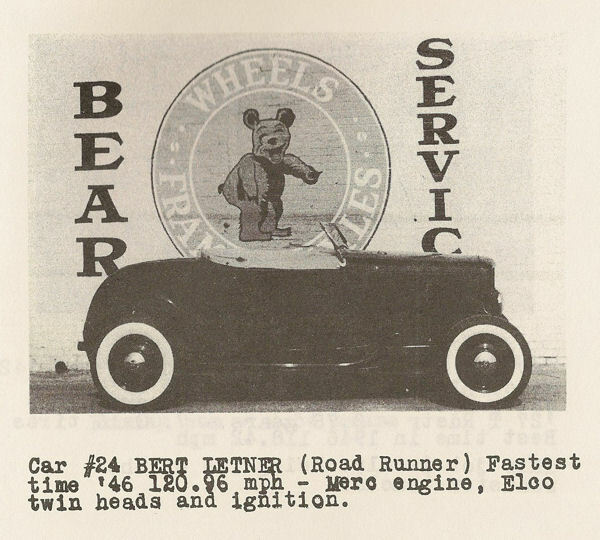 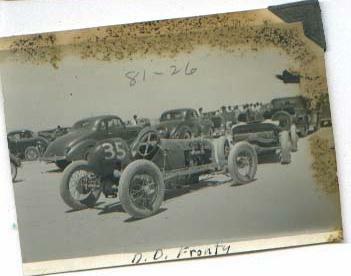 The program listed Fred's car as a '29 A chassis with a T body and Don's as a Deuce. 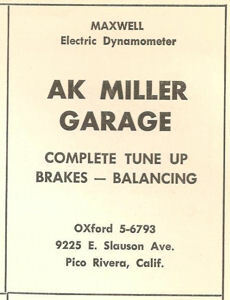 Don't have any results from that meet. 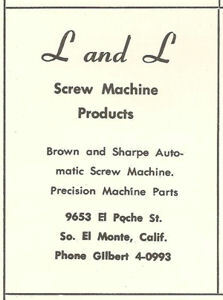 In September both were back. 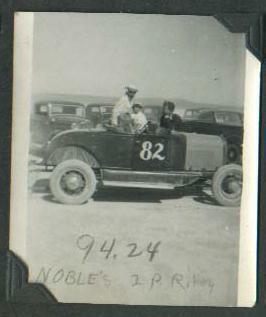 The program now had Don's car as a '29 on '32 rails. 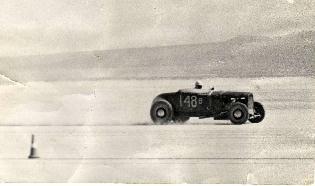 Fred ran 126.76 mph for 7th and Don ran 120.96 mph for 19th in class. 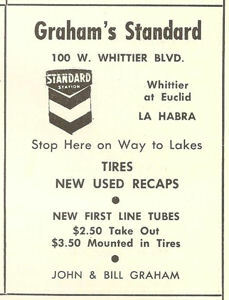 In October they were back. 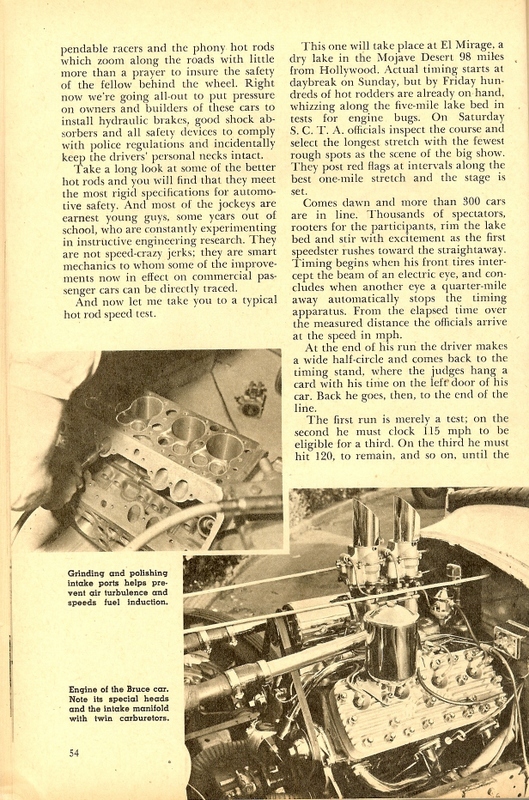 The program said Don now was running a Huck ignition. 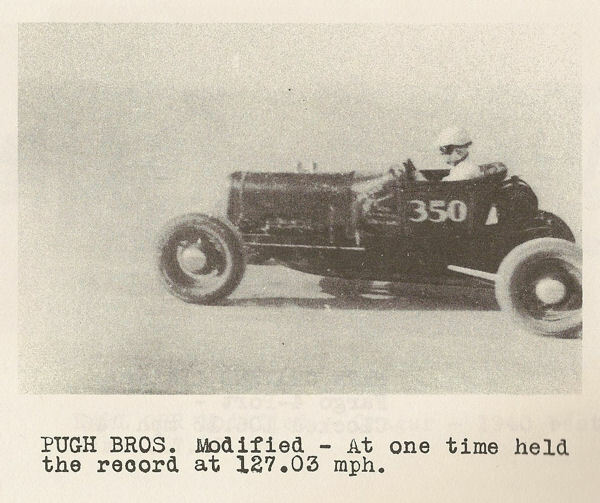 Fred ran 124.30 mph for 4th and no speed was listed for Don. 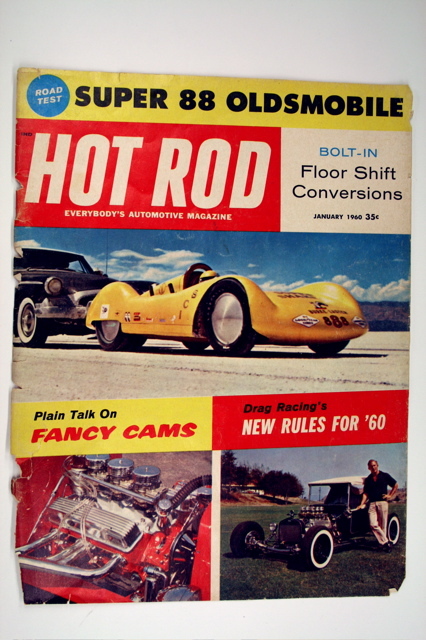 In the Dec. '48 issue of Hot Rod there is a pix of Fred's car on page 9. 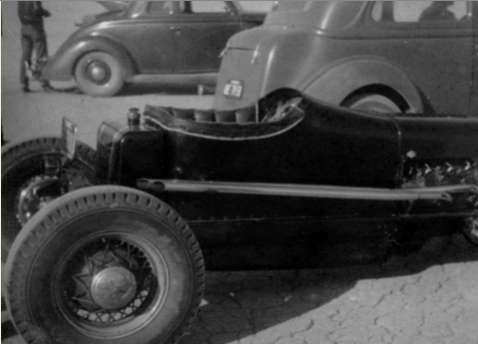 Here's what I found on the B Lakester # 55: '27 T body with a '46 Merc, 249", now with Meyer heads, Evans intake, Finkle cam and Huck ignition.. 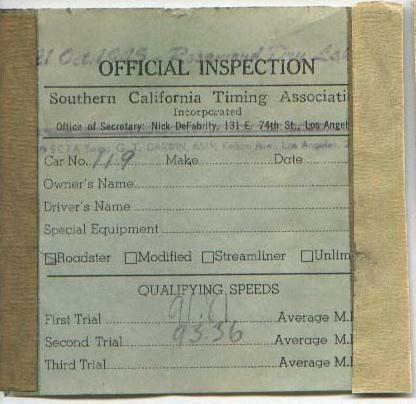 Entered in May, no speed. 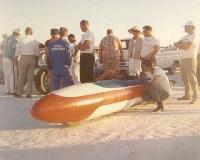 Entered in June, ran 137.82 mph for fourth in class. Entered in July, ran 139.96 mph for 5th in class. 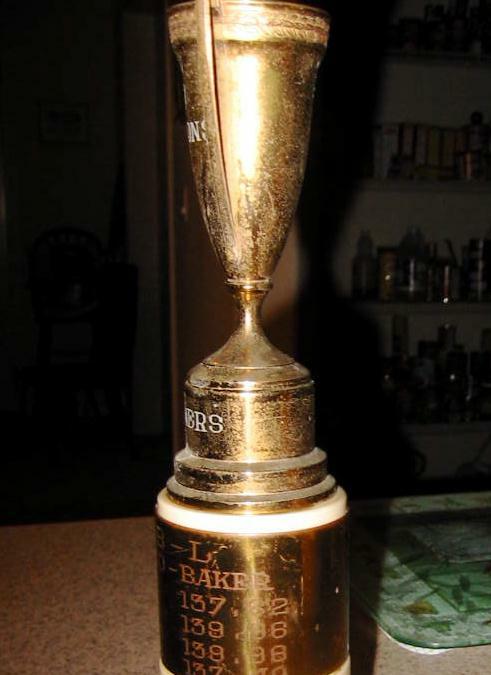 Entered in Sept. by Fred alone. 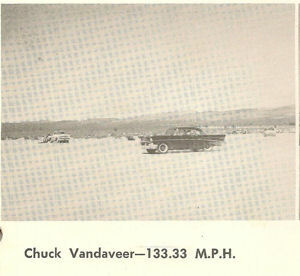 Ran 139.96 mph for 4th. 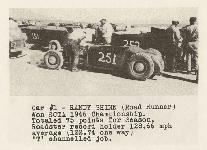 A little info on the (Reno - Baker) 27 T Lakester, Frank Breen and Harvey Haller. 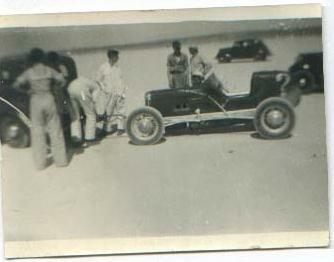 I blew the engine in my 29 A at El Mirage, it must have in 1948. 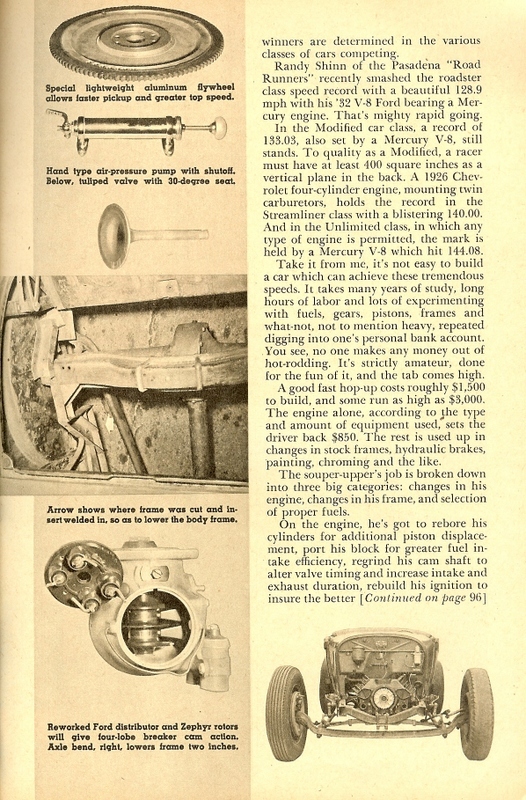 I don't know why but the pistons and valves met and were really messed up, the cam shaft was in several pieces, but for some reason the block was ok. 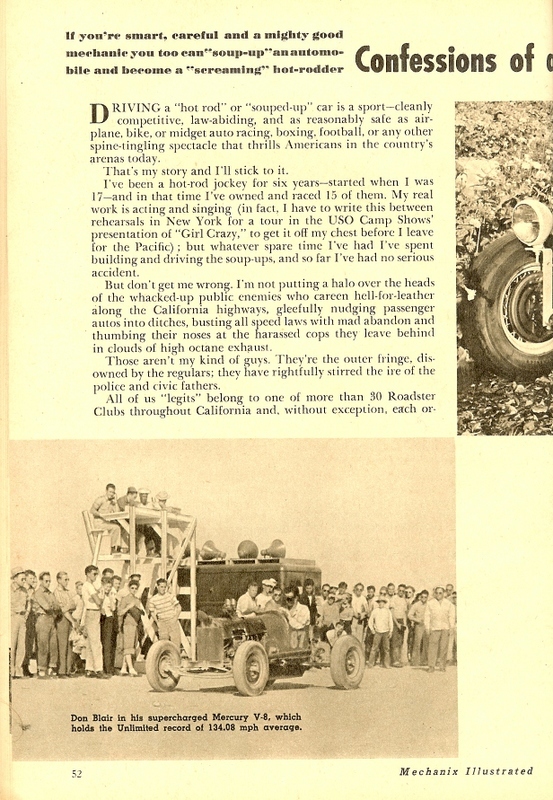 I had decided I was going to build the T before this happened. 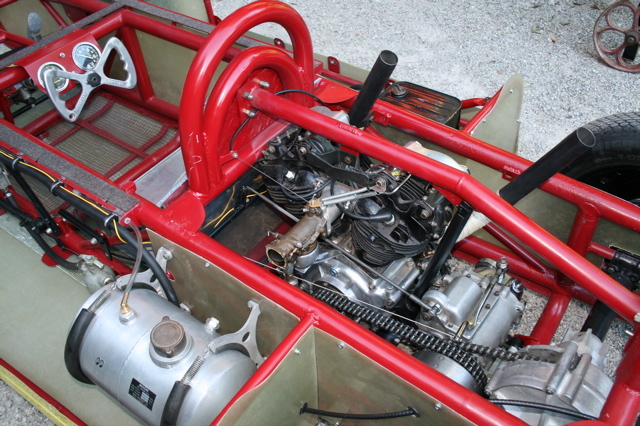 The rear engine T had a drop tank nose, and a full belly pan (and) it was quite streamlined. 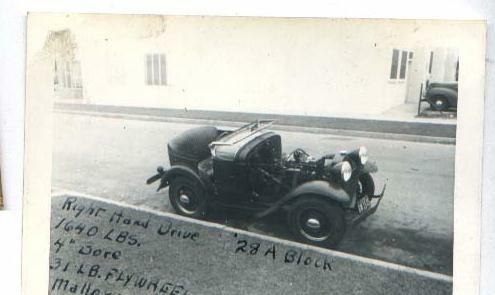 I could reach out from inside the car, over the door and put my hand on the ground. It was painted school bus yellow with red flames on the front end. 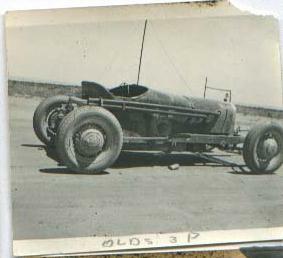 It wasn't a bad looking car. 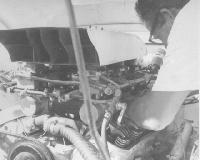 Fred Reno helped build the T because we had decided to use his engine in the T (since) my engine wasn't ready yet. All we did mostly was stick his engine it theT without doing anything to it. 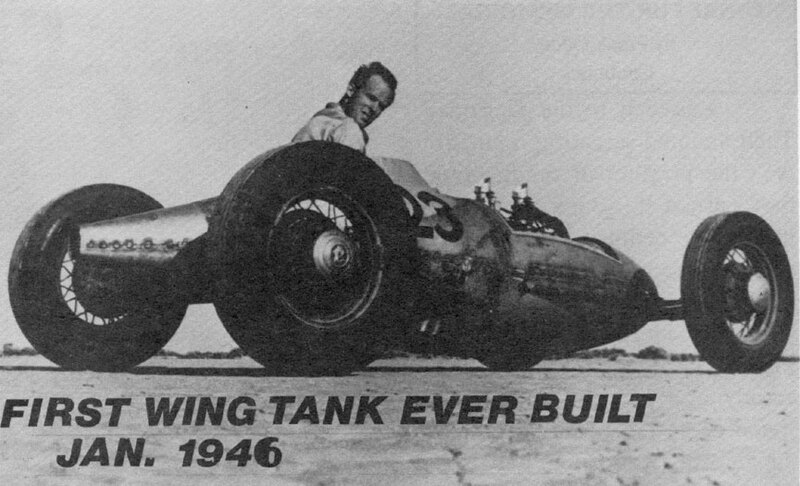 It went about 20 mph faster than when it was in his car. 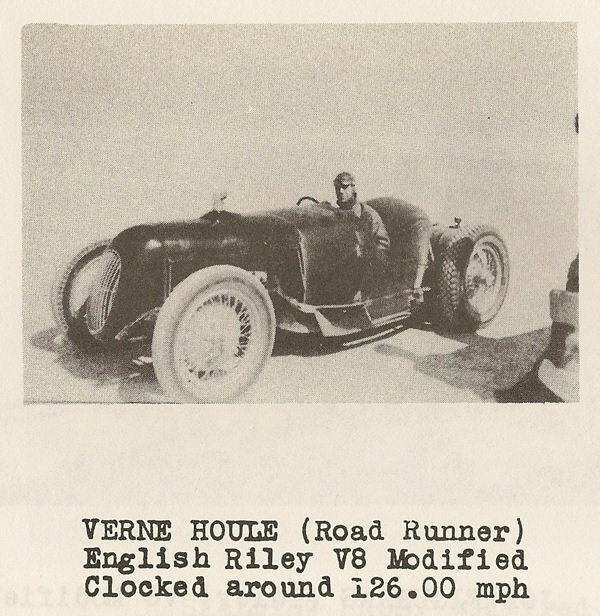 Frank Breen and Harvey Haller (Road Runners) had built a Bill Burke type streamliner with a flathead Ford engine. 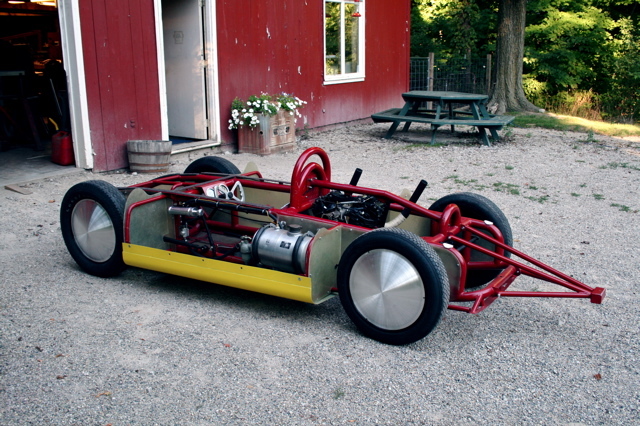 I made the rear end in the T the same as their streamliner, with the idea of changing back and forth if need be. 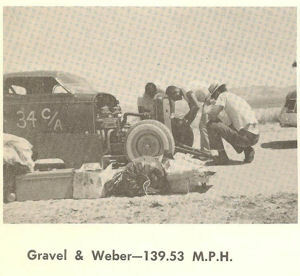 Mine had 3:27 gears theirs had 2:84's. 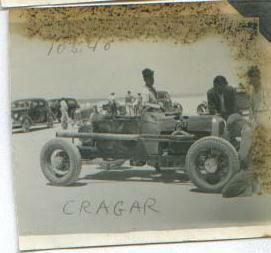 We never did change. Breen and Haller later put a Chrysler Hemi in the tank and took it to the salt flats and I think they broke 200 mph. 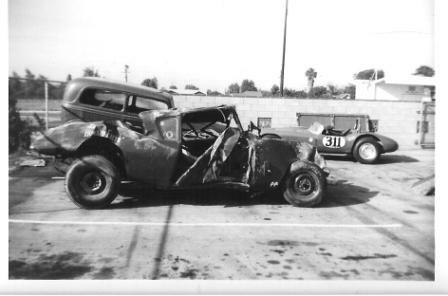 Unfortunately Harvey died from an accident he had there. 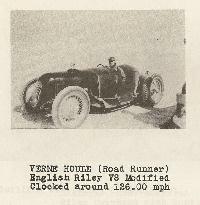 Webmaster Note: Fred Reno's name recorded as Renoe in some records. 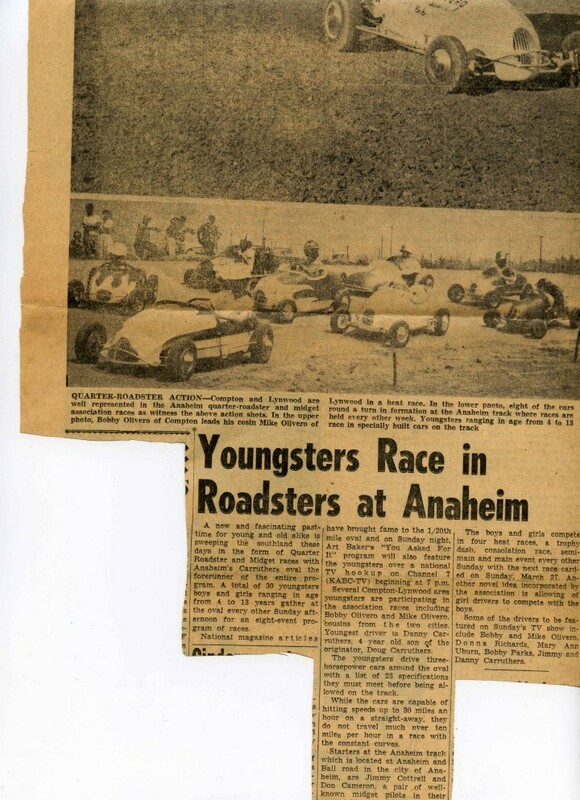 The panoramic shot looks like it was shot at Santa Anita. 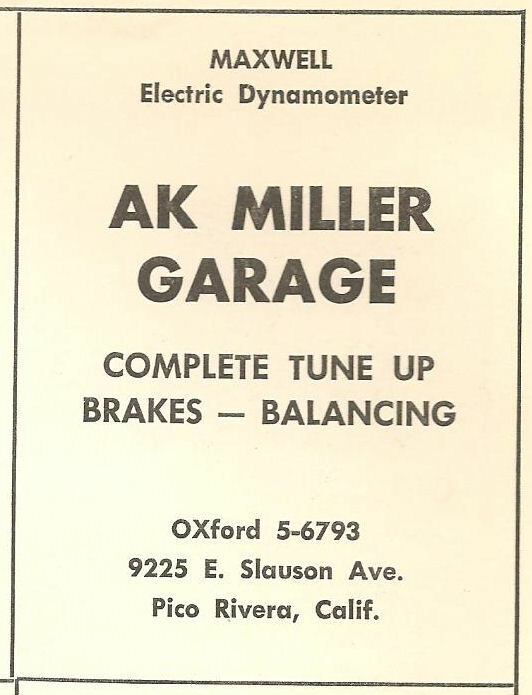 Ak is standing next to his deuce powered by a Buick straight-8 and featuring Buick independant front suspension. 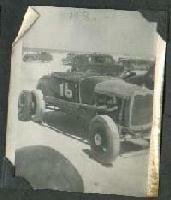 He ran the car at the lakes in '47 as car # 115. 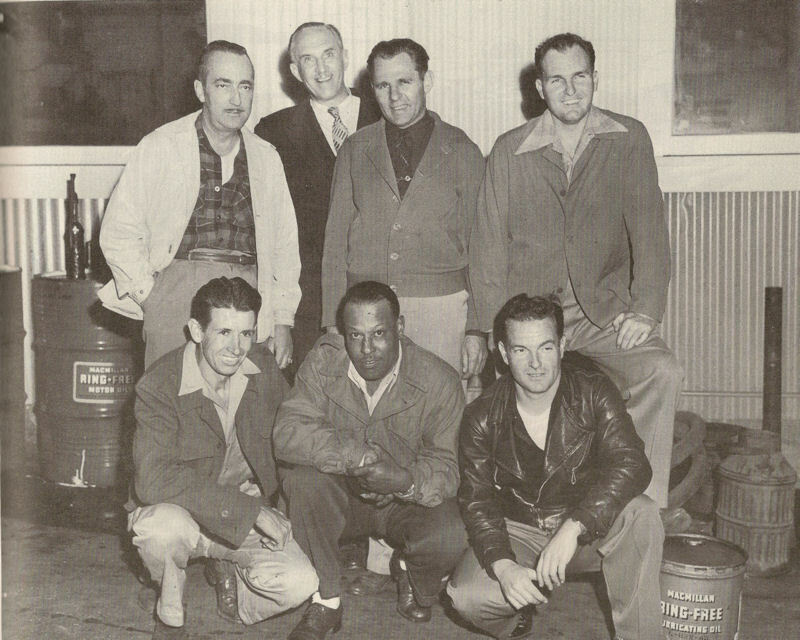 The fellow to his right in the darker jumpsuit looks like Ak's brother Sigfred. 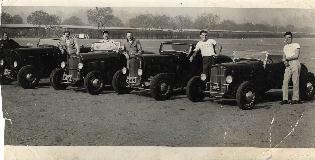 Don't know the others. 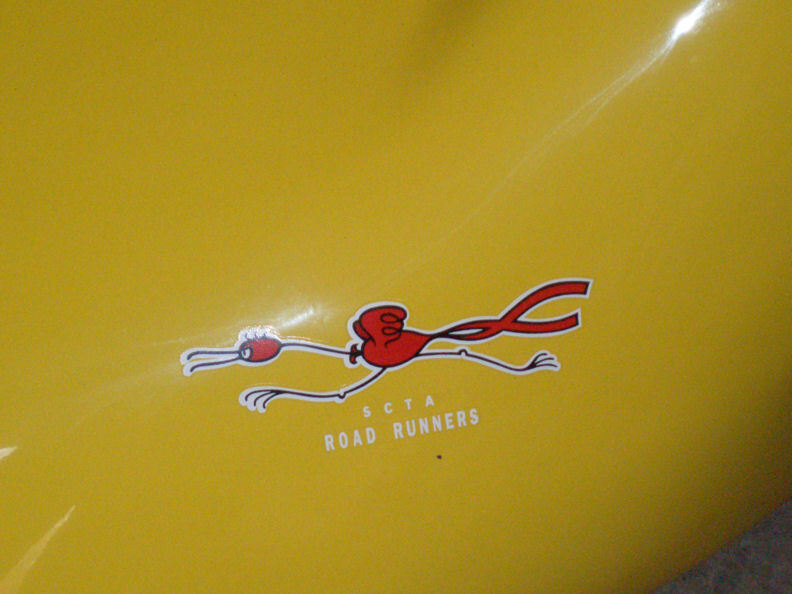 Webmaster Note: These Road Runners Club photos are cropped from the Car Culture article to the right. 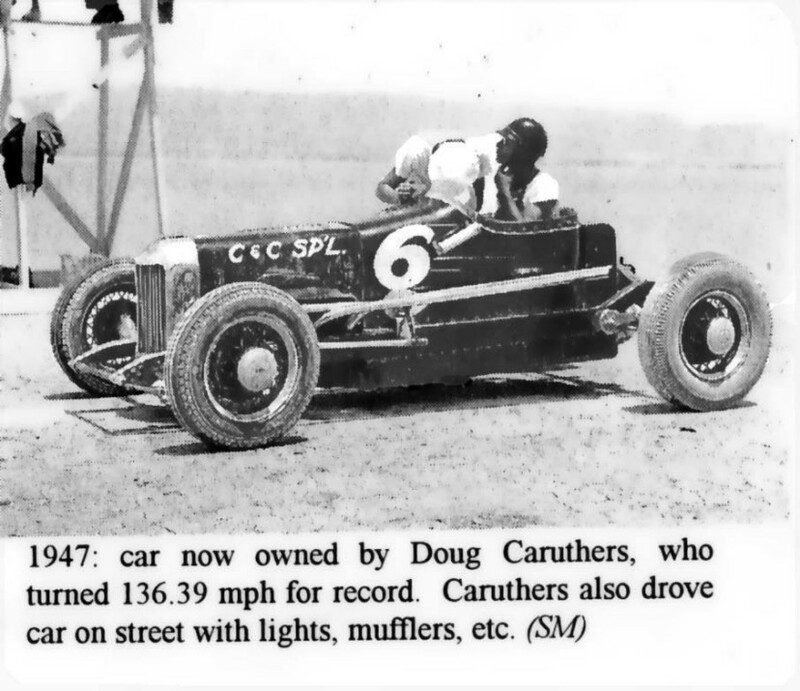 The majority of the following images were provided by Doug Caruthers' youngest son, and Associate Road Runners Member, Roy Caruthers. 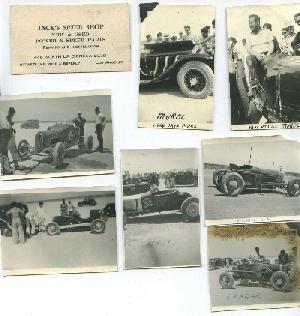 Some pictures provided by Jim Miller. 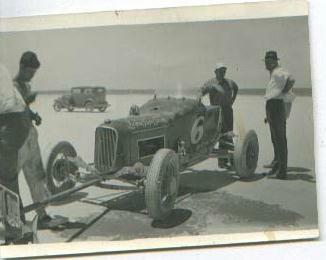 Roy is also building a replica of Doug's #6 C&C Special and hopes to bring it to El Mirage to display. Roy lives in Indianapolis. 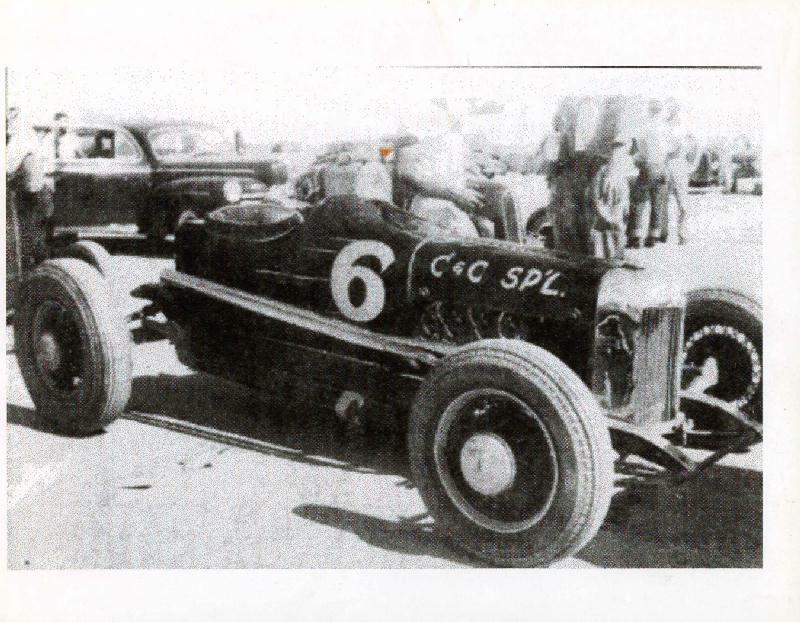 Wally Parks behind the wheel of the #6 C&C Special. 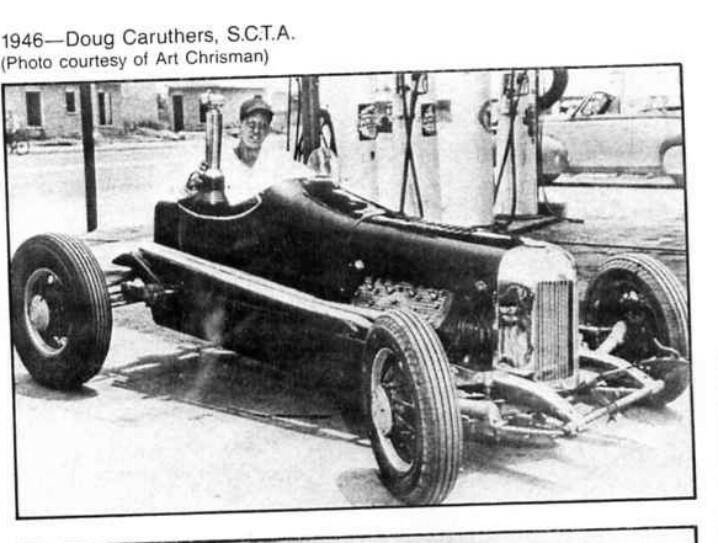 Following conversion to the Chrisman #25 Dragster. 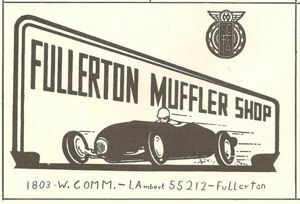 Car is now in the NHRA Museum in Pomona. 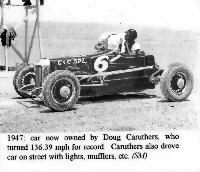 Doug Caruthers had a very successful career in USAC as a driver, builder, mechanic and car owner. 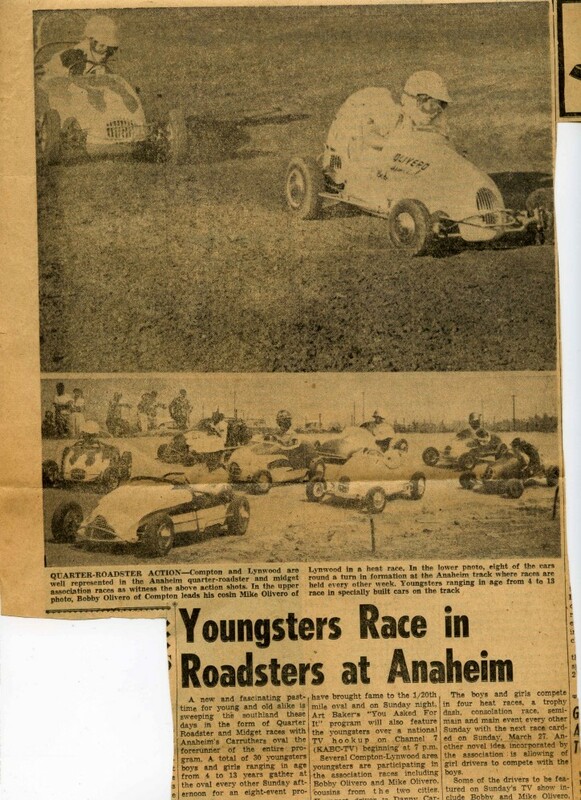 Many well know drivers from the 50's, 60's and into the 70's drove his USAC Midgets. 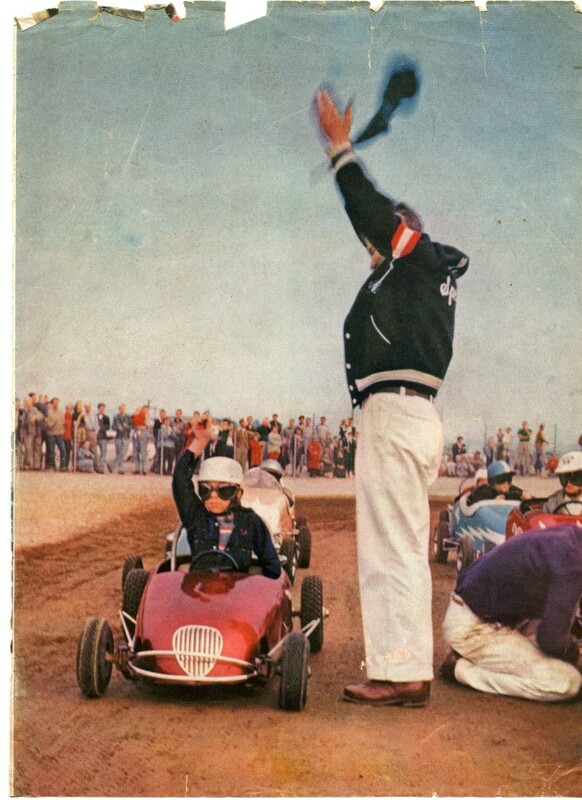 His two oldest sons, Jimmy and Danny both had very successful careers in Midgets and other USAC racing, including Indy. 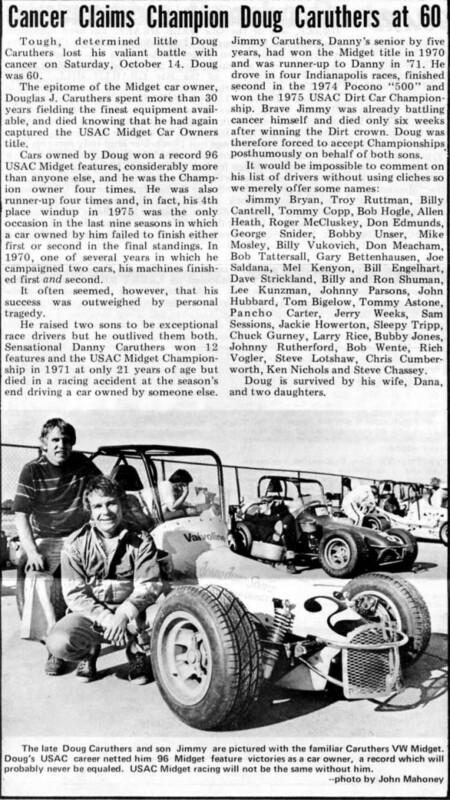 Doug, Jimmy and Danny are all Midget Driving Champions and all are in the USAC Hall of Fame. 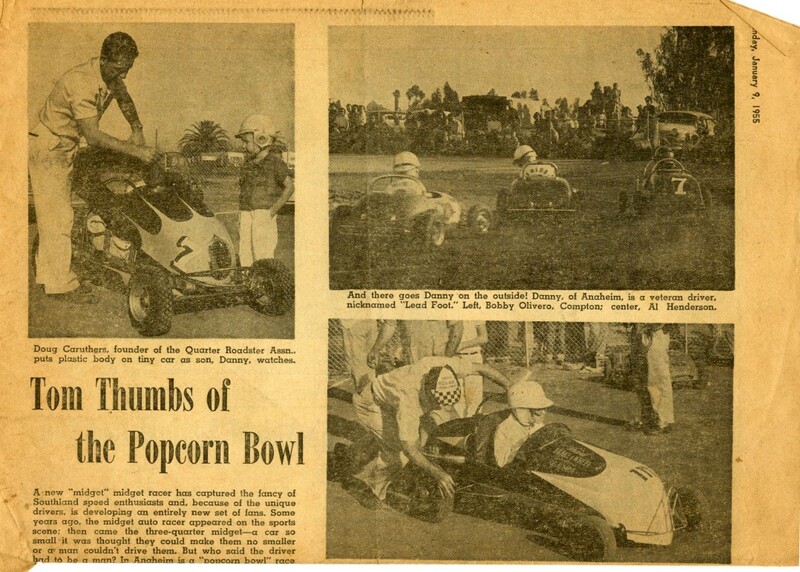 Doug also was responsible for developing Quarter Midget racing on the West Coast. 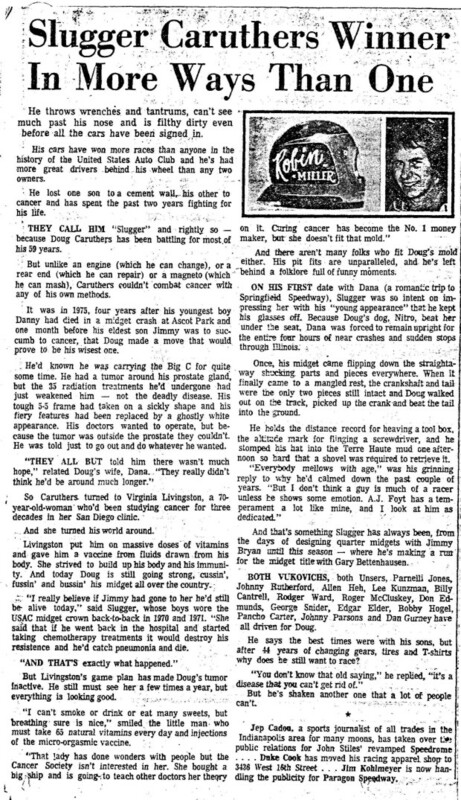 The links below are reproductions of 16 articles about that part of the Caruthers story. 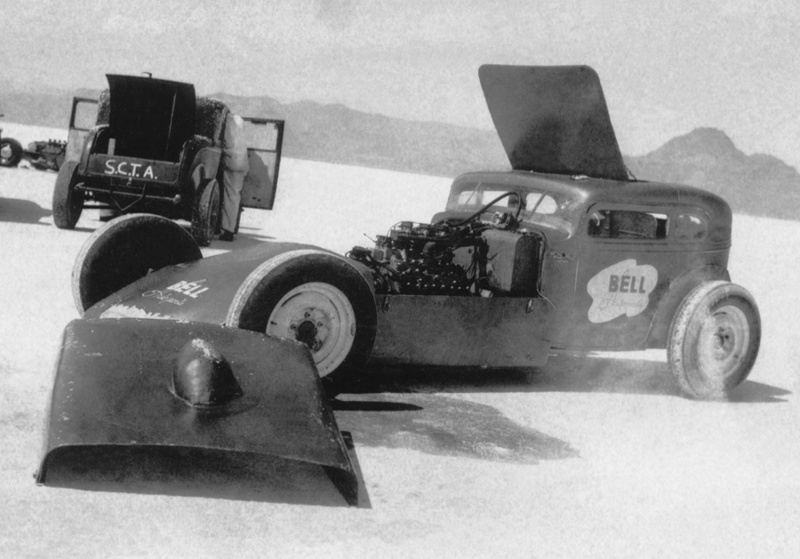 Following WWII, Belly Tank Lakesters began to appear at the dry lakes. 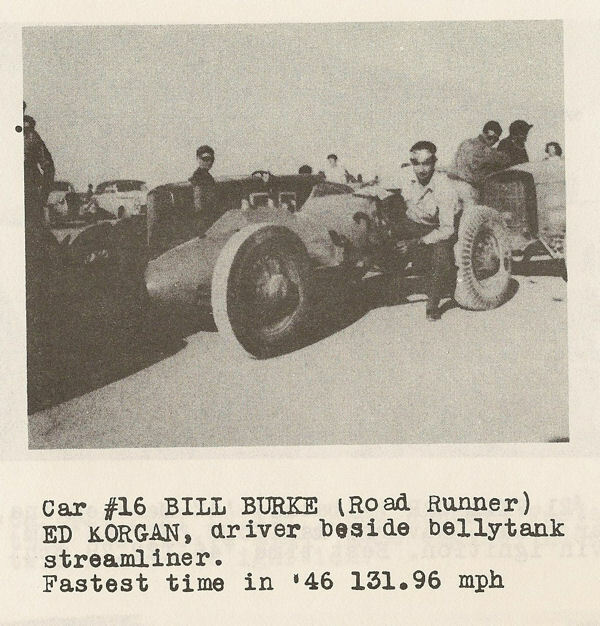 In 1946, Road Runners member Bill Burke is recognized as having been the first person to take an Army Air Corps, surplus P-51 wing tank, build a rolling chassis, stuff in an engine and run it at an impressive 131.96 mph. 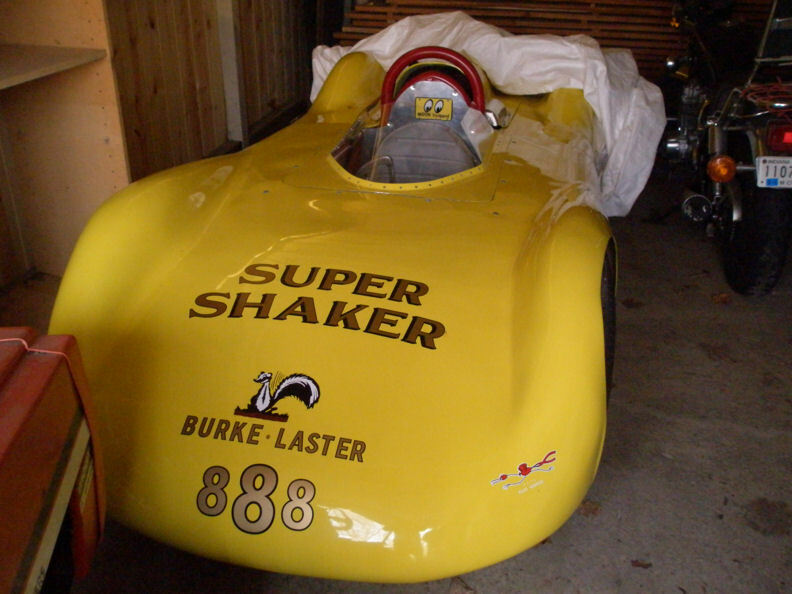 Bill's first Belly Tank Lakester was a front engine design. 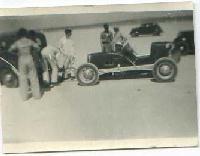 The first four pictures below are of that trend setting racecar. 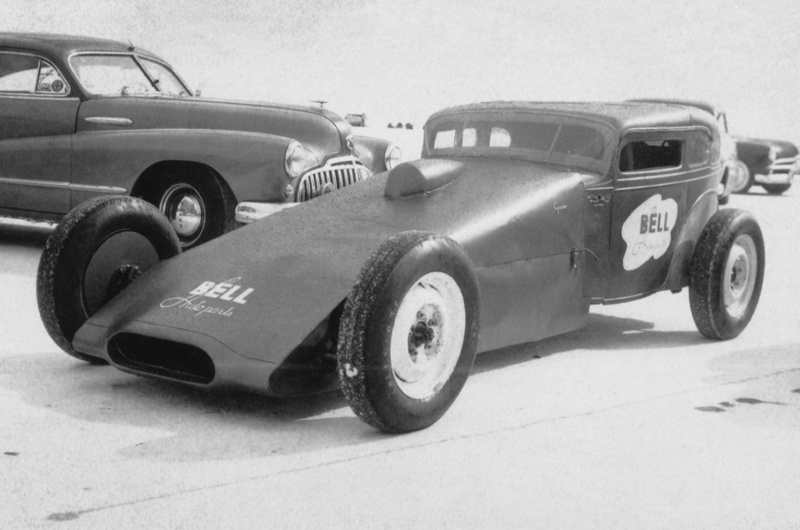 Bill went on to design and build numerous Land Speed race vehicles, including the famous SoCal Speed Shop Belly Tank Lakester. 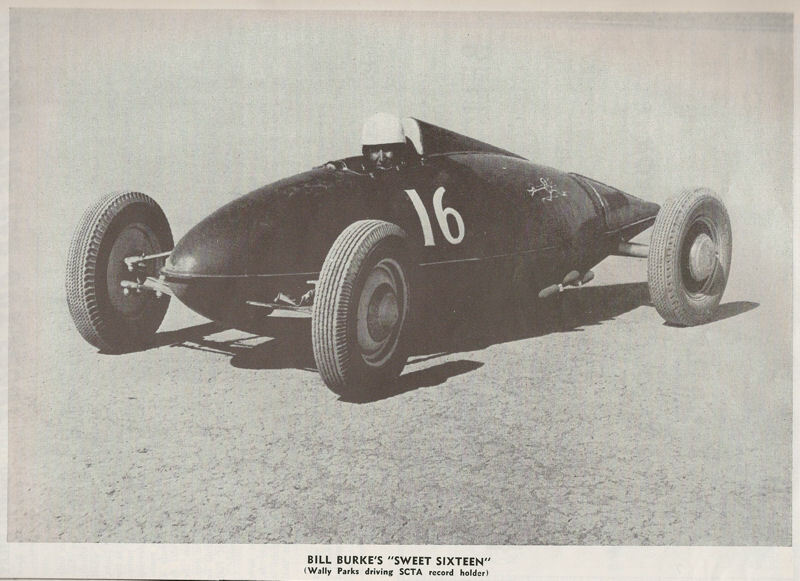 Bill has a long list of accomplishments, accolades and honors including: AHRF (American Hot Rod Foundation) Pioneer, inventor of the Belly Tank Lakester, participant at the first Bonneville Speedweek - 1949, SCTA Points Champion 1949 with fellow Road Runners member Don Francisco, SCTA President - 1951, Bonneville 200 MPH Club - 1960, Dry Lake Racers Hall of Fame - Inducted 1996 and many more. 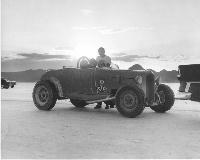 Bill Burke teamed up with Jim and Tommy Dahm for an assult on Bonneville in 1951. 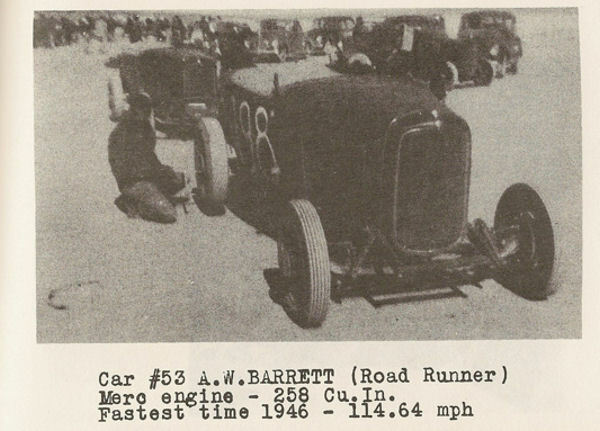 Running out of San Gabriel, the boys entered this Class B Modified Coupe consisting of a chopped Austin/American Bantam body fitted with a 249 Merc flattie that powered the car to 141.509 mph for second in class. 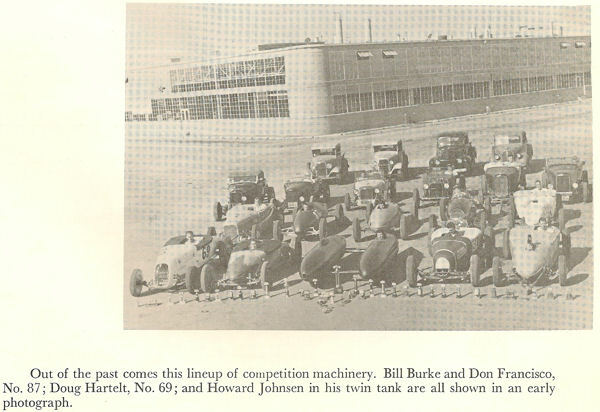 Look closely to see more WWII aircraft influences on Burke. 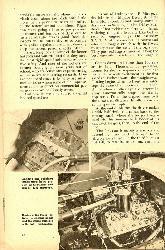 A Douglas A-26 Invader wing radiator duct was used for the nose grill-shell. 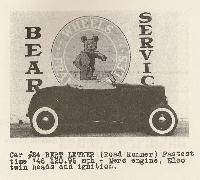 It is said that this is the last car Bell Autoparts ever sponsored. 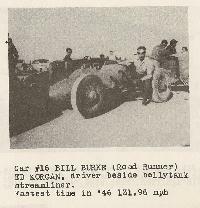 Bill also acted as the starter at the beginning of the meet and then quit. 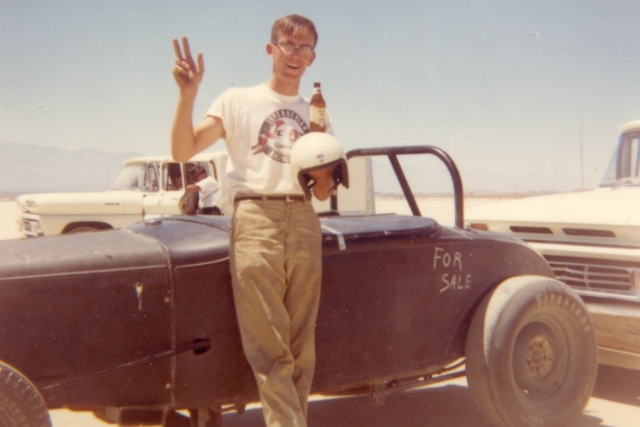 A young fellow by the name of Bob Higbee stepped up for the next 50+ years. 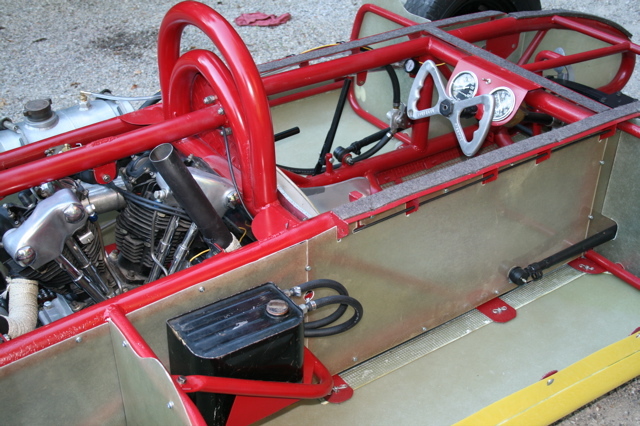 Restoration by Jerry Weeks-Baker, Indianapolis. 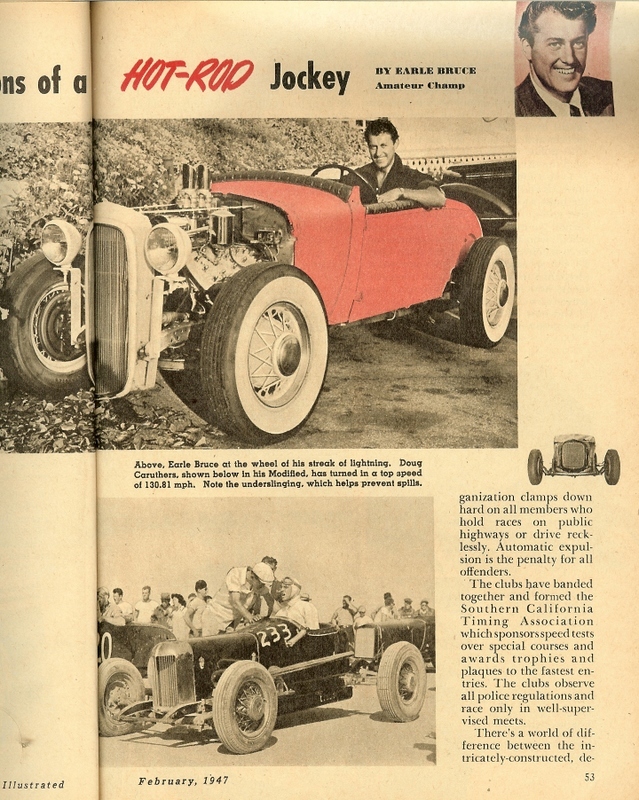 Road Runner Wally Parks was the first Editor of Hot Rod Magazine. I was looking at your Road Runners members list and noticed my Dad, Doug Ray (Ray, Ray & Dixson) listed. 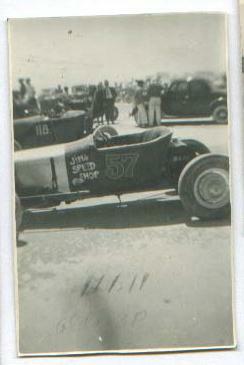 His racing partner and next door neighbor was Howard Dixson. 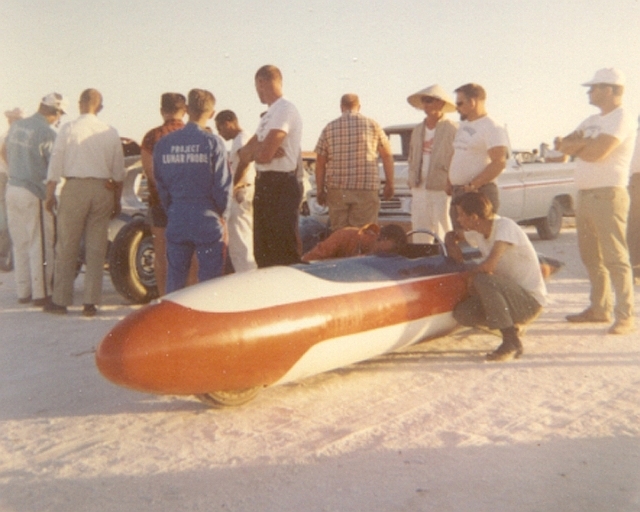 My Dad also helped build Dr. Nathan Ostich's J47 Jet Car, The Flying Caduceus back in the early 60's. 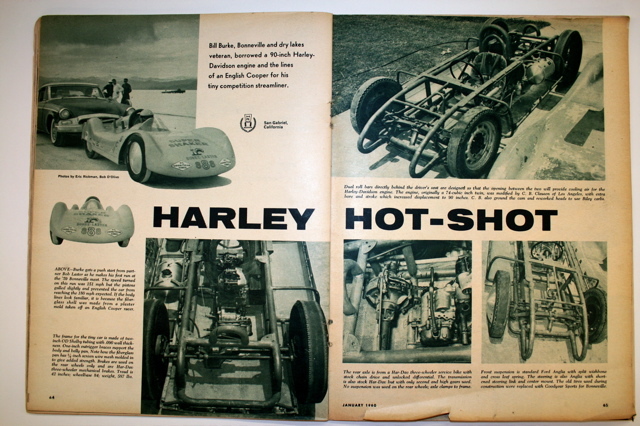 The Jet Car is housed at Harrah's Museum in Reno, Nevada. 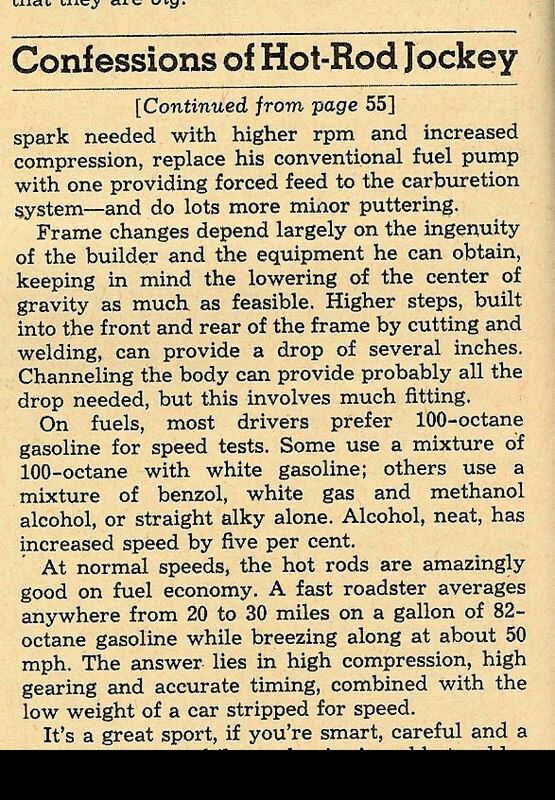 I hope this helps you with your research. 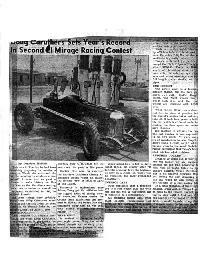 More from Doug Ray Jr. - I forgot to mention that my Dad became the first person to break and exceed 100mph in the 1/4mile in a factory produced stock car at Lions Drag Strip. 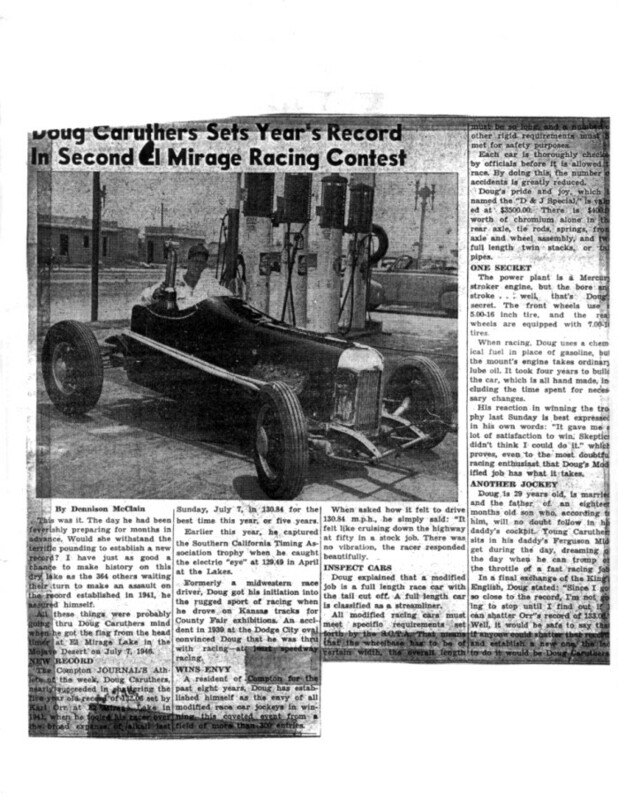 He did this in 1957 and I believe the month was sometime in the summer (July or August). 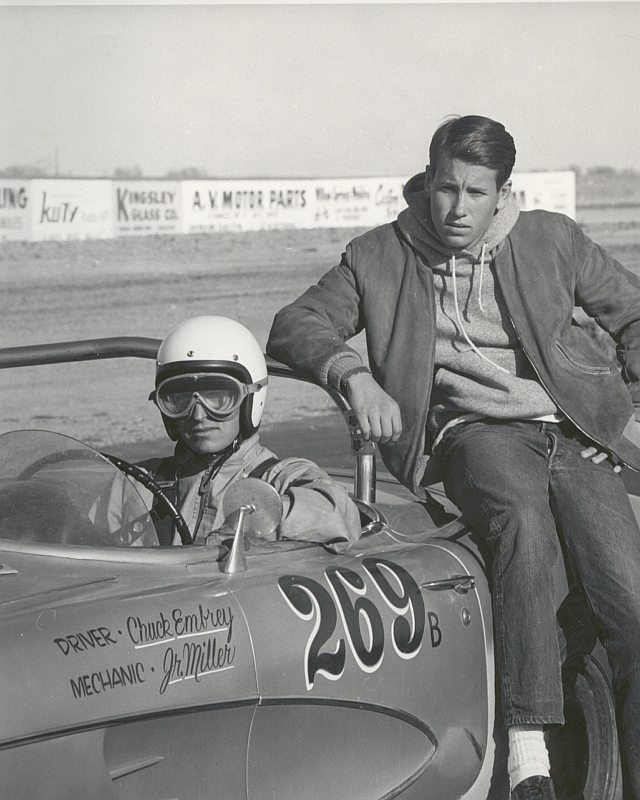 He drove a 1957 Pontiac Chieftan with a 347. 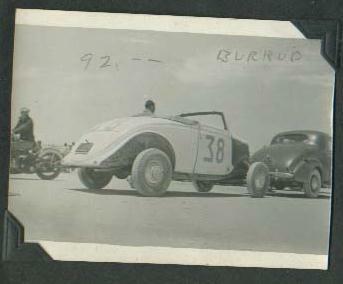 I remember reading the story about this in (I believe) Hot Rod Magazine. 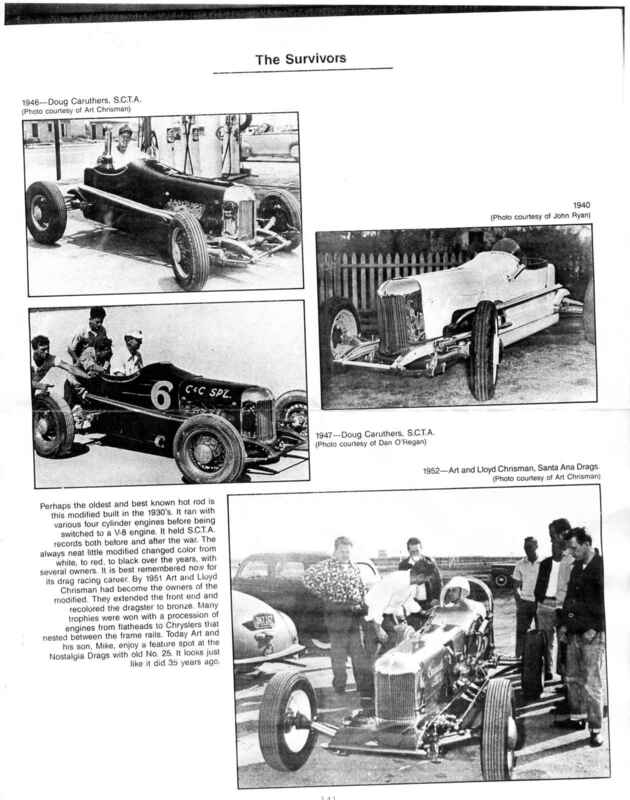 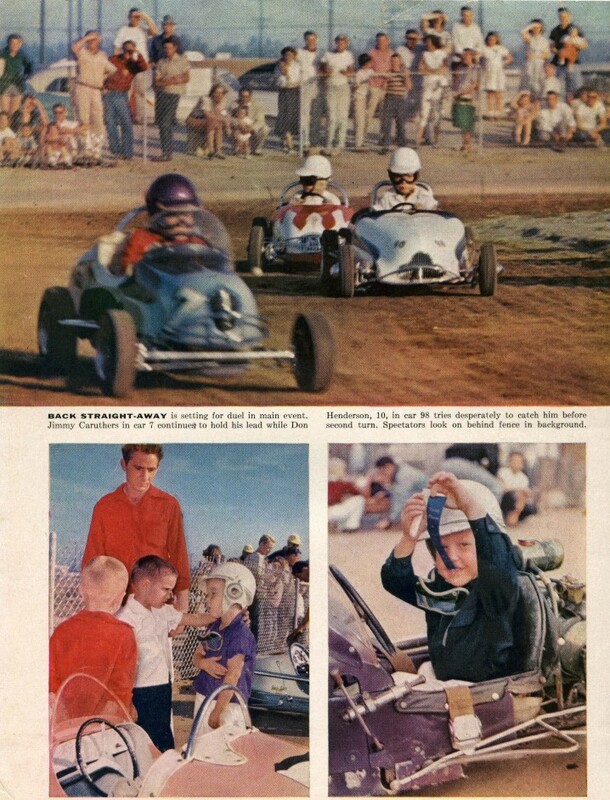 The story started out by saying, "Name any track in Southern California and you can bet Doug Ray of Missile (Firestone Missile Division) holds the record...."
My Dad and Howard Dixson raced together as Ray and Dixson. 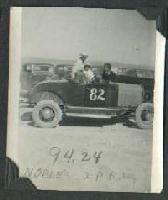 My Dad drove the Pontiac and Howard drove a Chevy pickup truck. 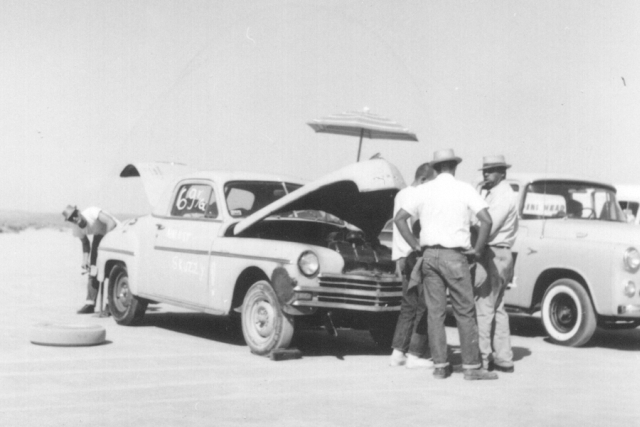 I think it was a 1956 stepside. 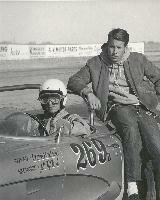 They both knew Ak Miller, Ray Brock, Mickey Thompson, Dean Moon and many others as well. As I come up with more info from my father's memorabilia I will forward it on to you. 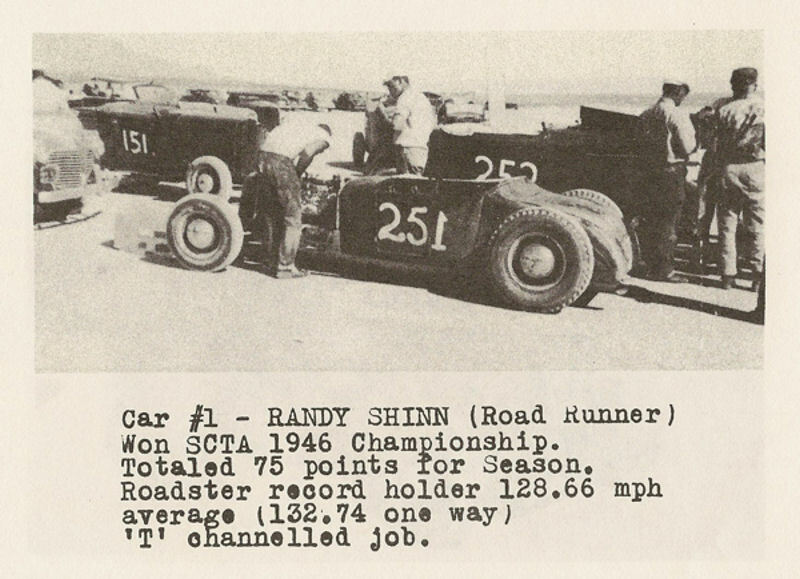 I feel these pioneers need more recognition on the internet because they played a big part in racing history. 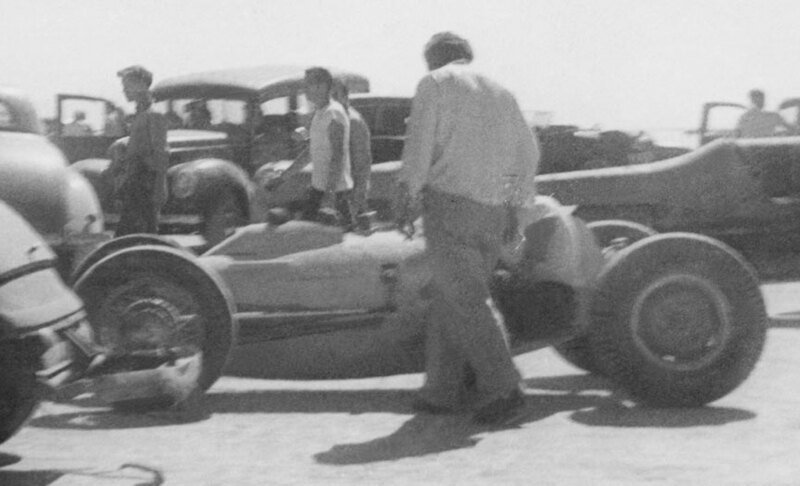 Originally a drag racer, the Pontiac made a transition to El Mirage as the Dixson/Ray Pontiac. 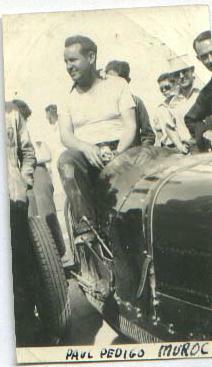 Doug is pictured here with some of the numeruous trophies the he won with this car in it's Drag Racing days. 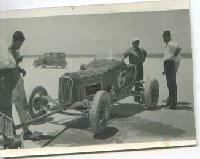 Cars from "The World's Fastest Indian"
The car was a 5 window coupe (belonged to Marlon Sefton, Rod Rider Pres). 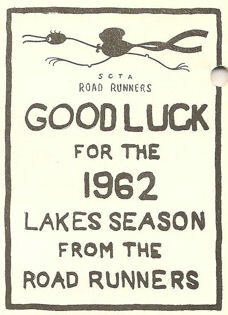 Later belonged to Holmes & Kugel, Road Runners. 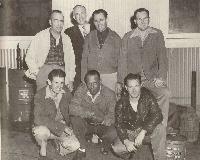 Lowell, has his back to us, wearing brown plaid shirt. 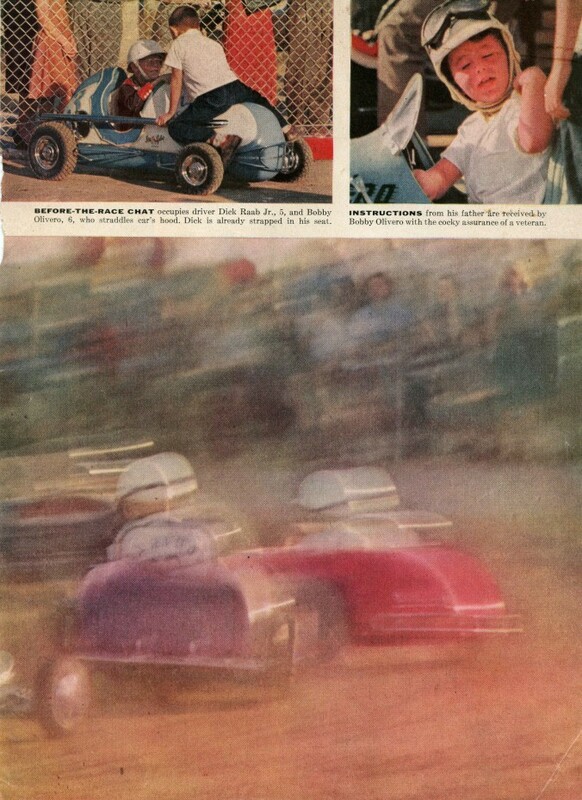 You can see why we called him "Big Red". 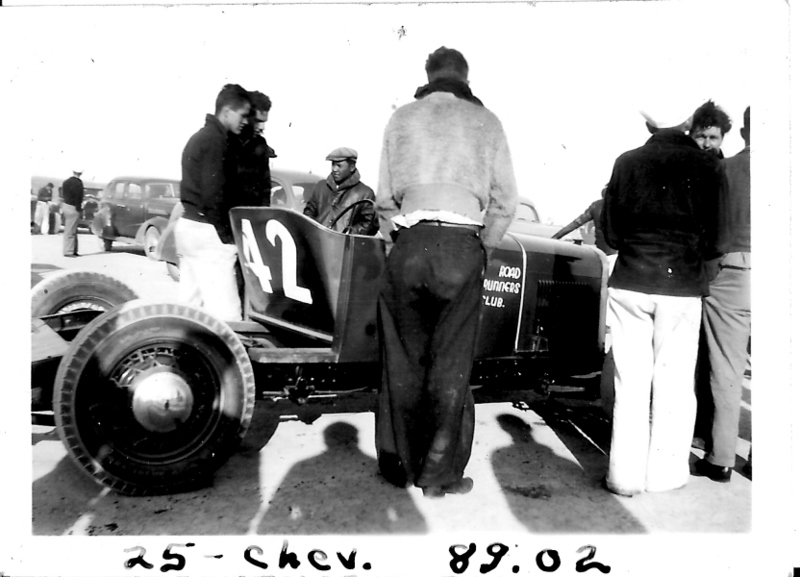 Dickie Valenzuela, behind Roger Crowe's 34 sedan. 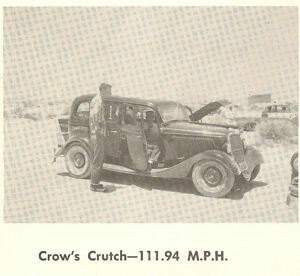 The sign says, "Have Chevy Will Race", hidden behind Dickie's head is a painting of a crow with a crutch under one wing (the car was known as "Crowe's Crutch). The Fulerton Muffler crew. 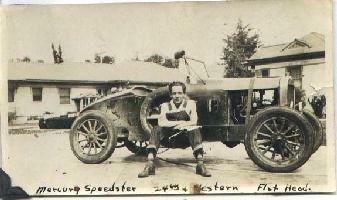 Thats Emil Grissotti (Grigs) with cigar on the right. 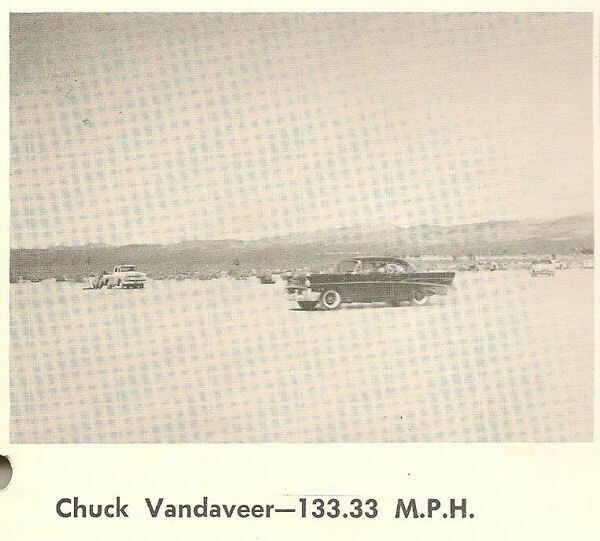 At Bonneville, 1966 (record in X/FR). 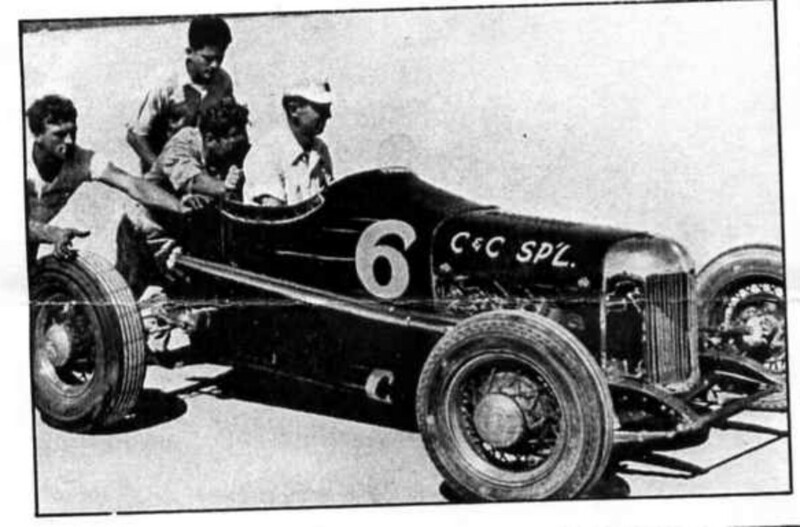 Ted Pearson stading by car, and Chuck Embrey behind wheel. 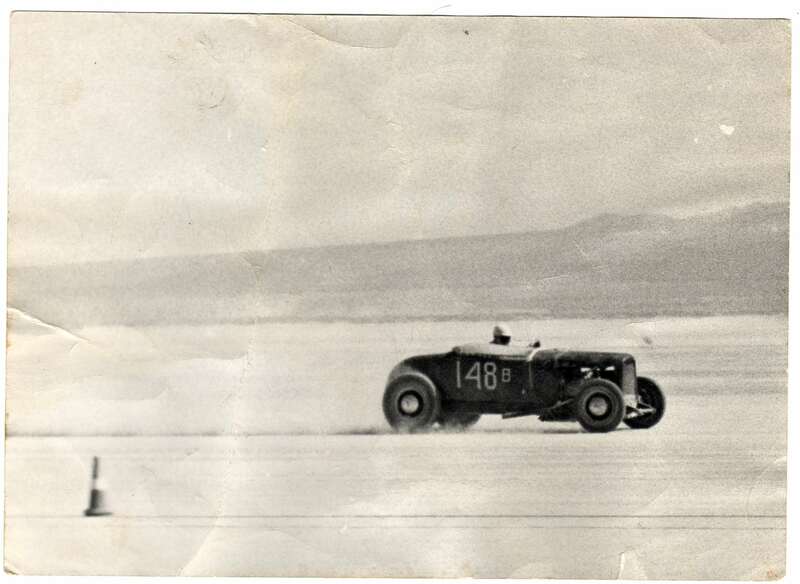 Photo was in Hot Rod's event coverage of Bonneville Speedweek. 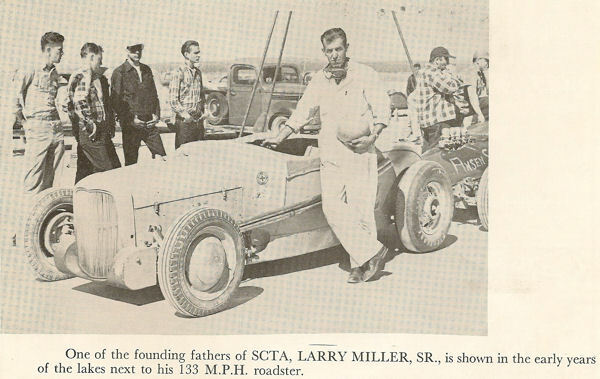 "In the genes" - Larry Jr. is the son of Larry "Dad" Miller, and nephew of Ak Miller and "Zeke" Miller, Charter Members of the Road Runners, 1937. 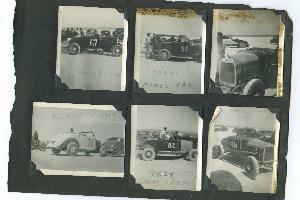 Many thanks to Chuck Embrey for the photos and information in this collection. 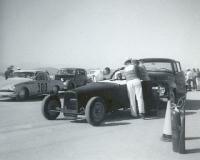 Willow Springs road course, Chuck Embrey behind wheel and Glenn Miller sitting on car. 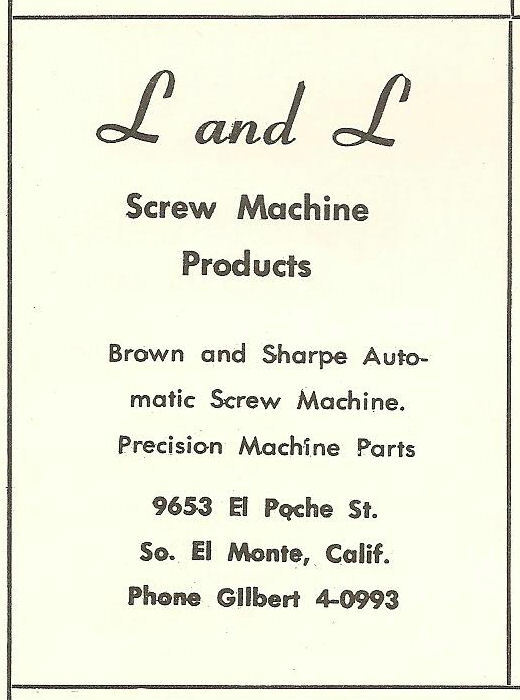 Can't remember Stan's last name. 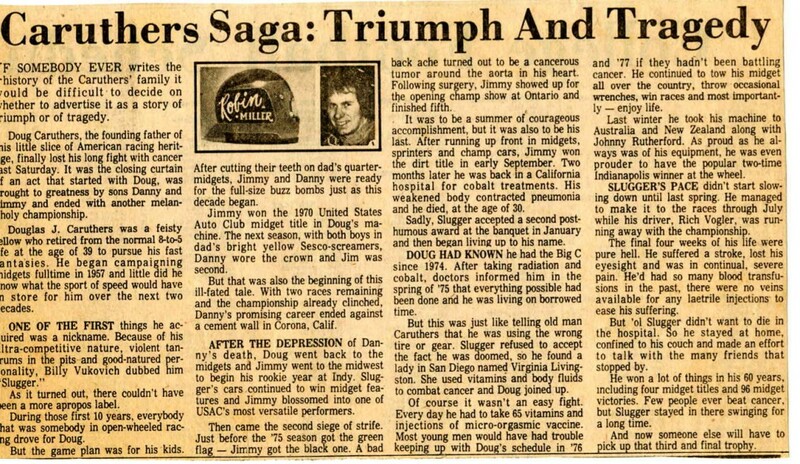 Ask Jerry Kugel, he should remember. 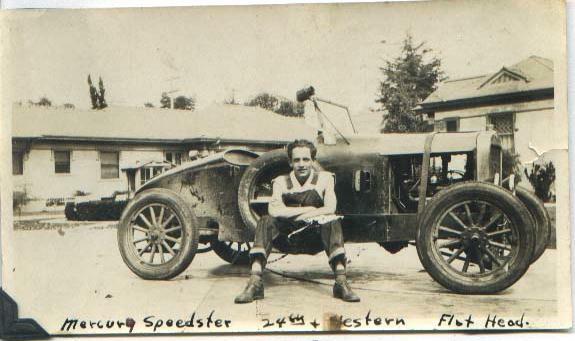 Chief Tech Inspector - Larry Miller, Jr.
Webmaster note: This looks like (and probably is) the Harvey Haller Roadster. 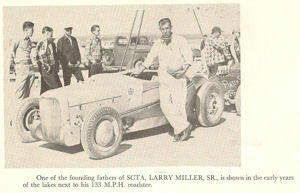 Don't know if Dad Miller had bought the car from Haller or was driving for him in this picture.